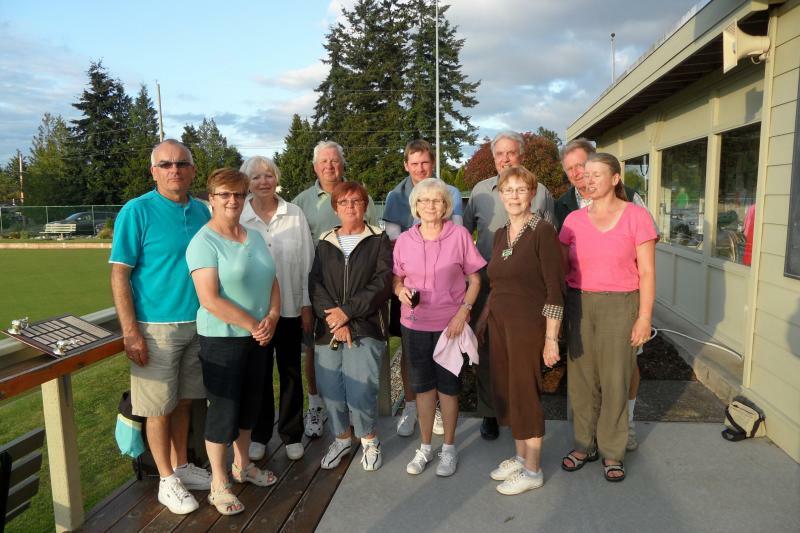 Some of the fascinating members who were in attendance. 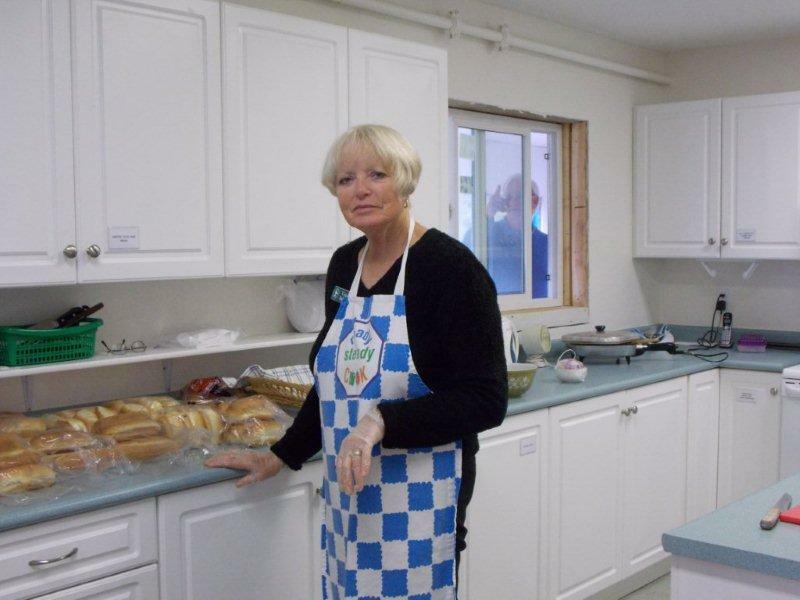 Appreciation to Vicki Banks for all her hard work in the kitchen during the season. 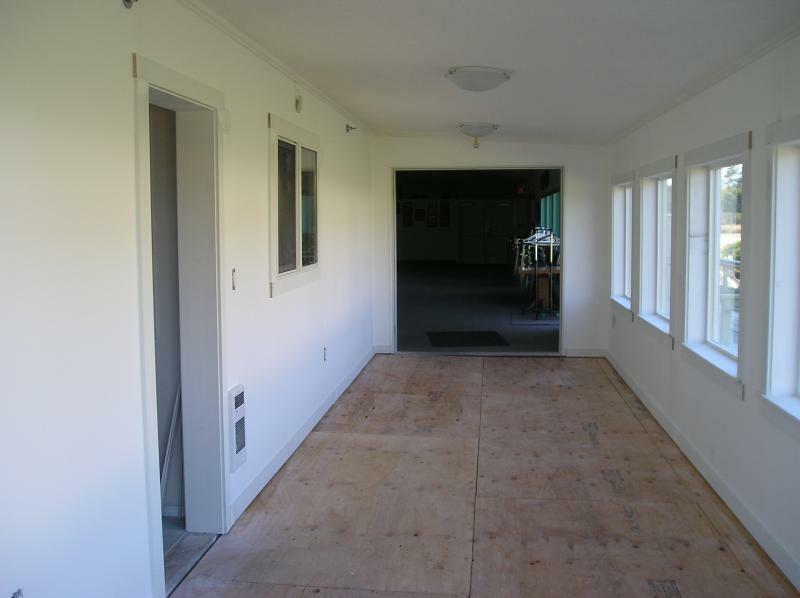 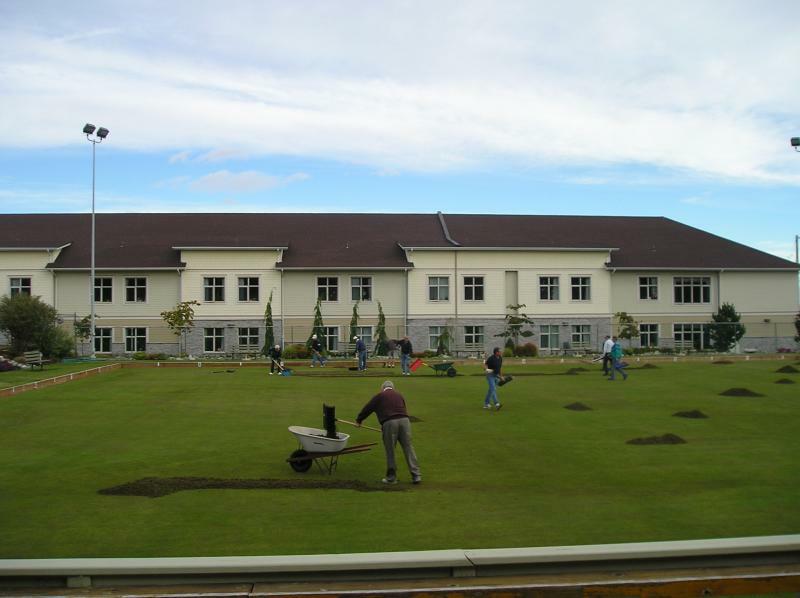 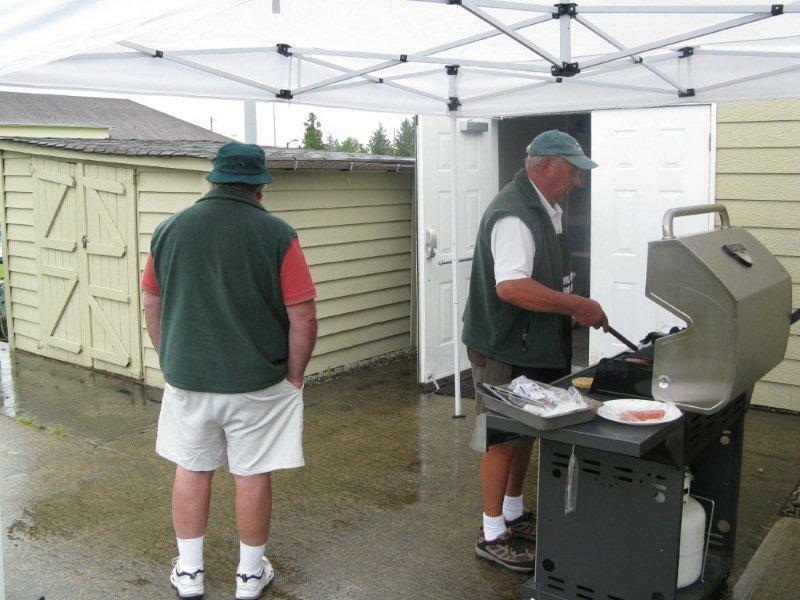 Mick was also quite busy, as usual, in getting things done elswhere around the club. 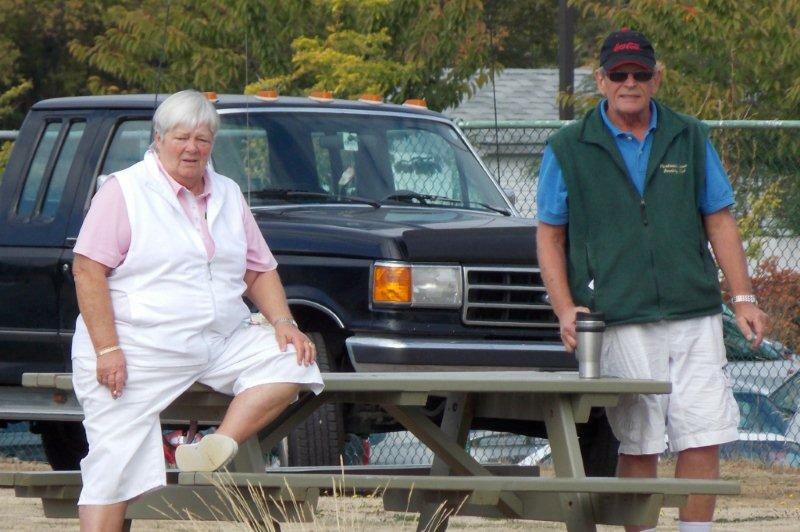 Thanks to both. 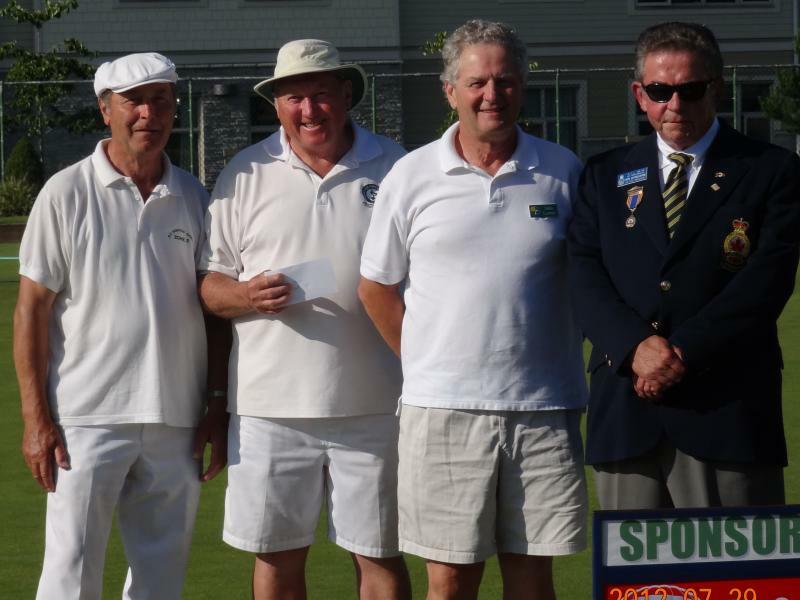 The 2012 games committee, led by Clive Arthorne; thanks to all for your time-consuming efforts in preparing for and ensuring the tournaments ran smoothly. 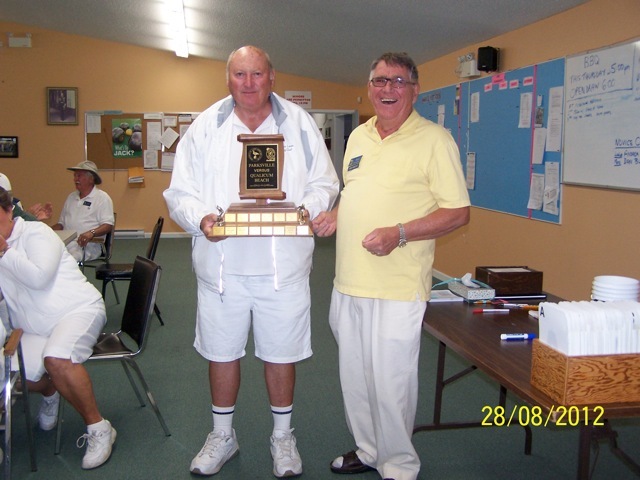 Mens singles champion - Stu MacNaughton - N/A. 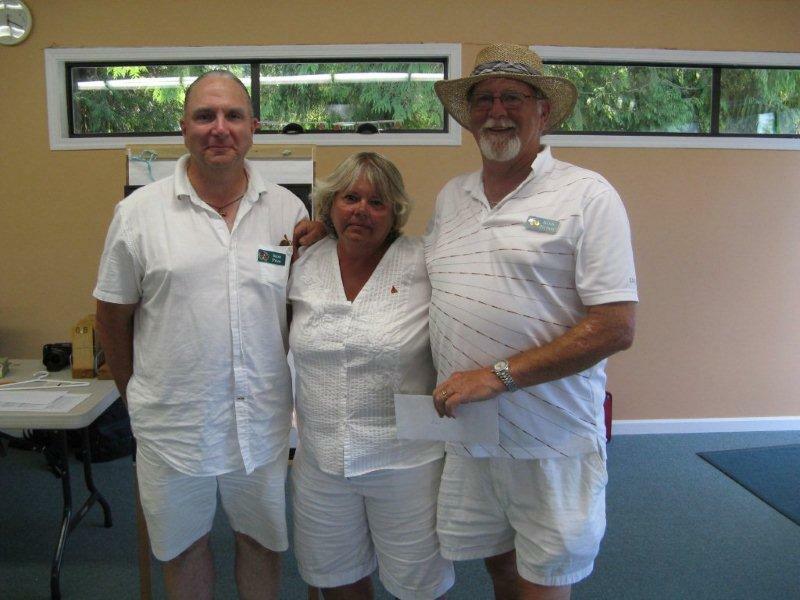 Early draw - second place - Wayne Edwards, Dianne Proctor, (John Larner). 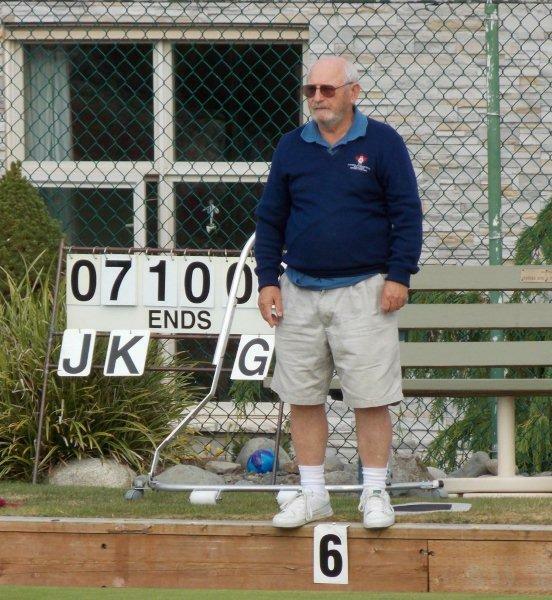 Clive presenting. 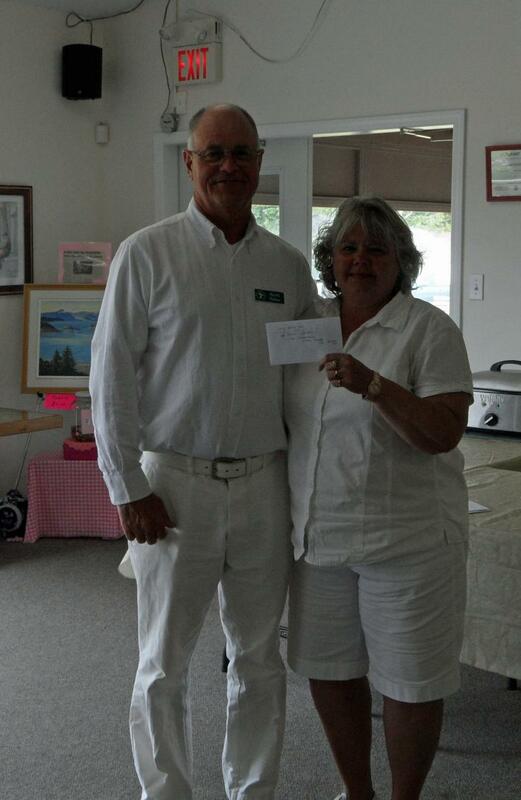 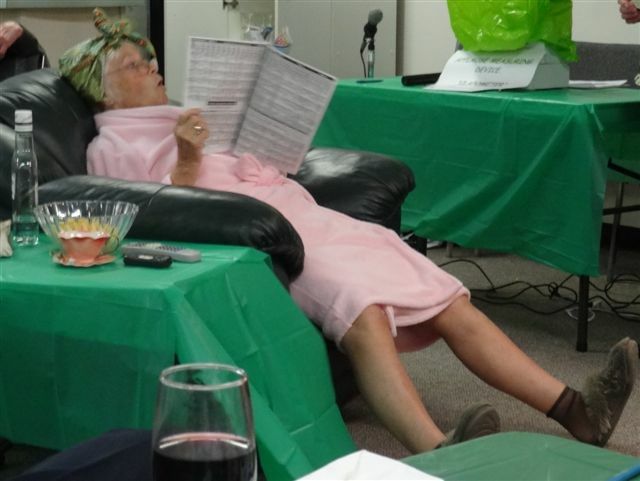 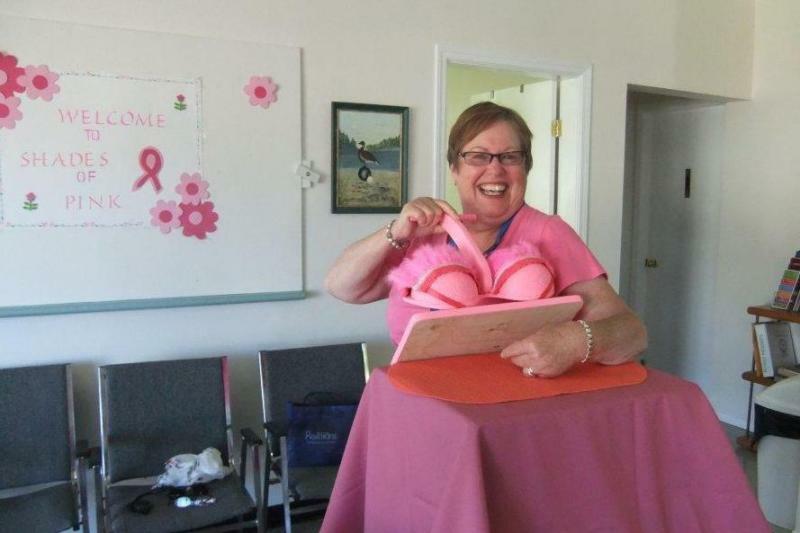 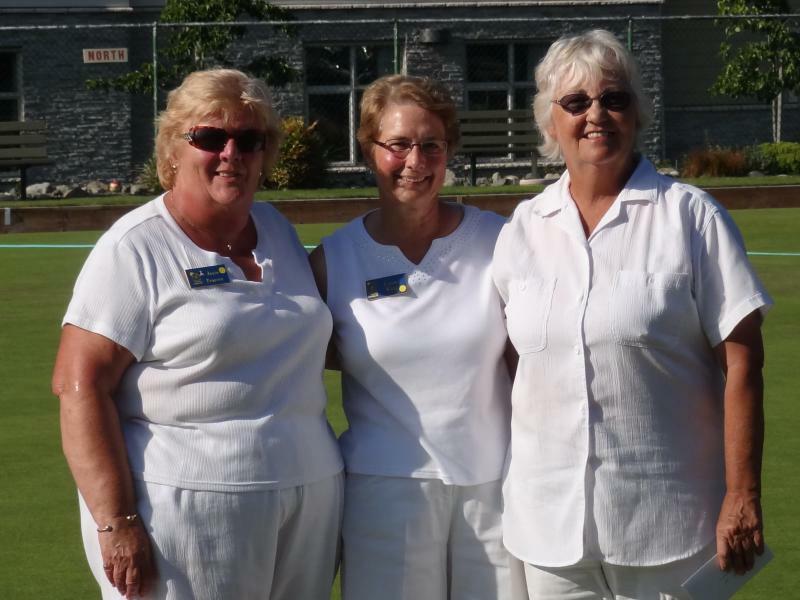 Early draw - third place - Brenda Edwards, (Francine Brunskill, Jerry Whitney). 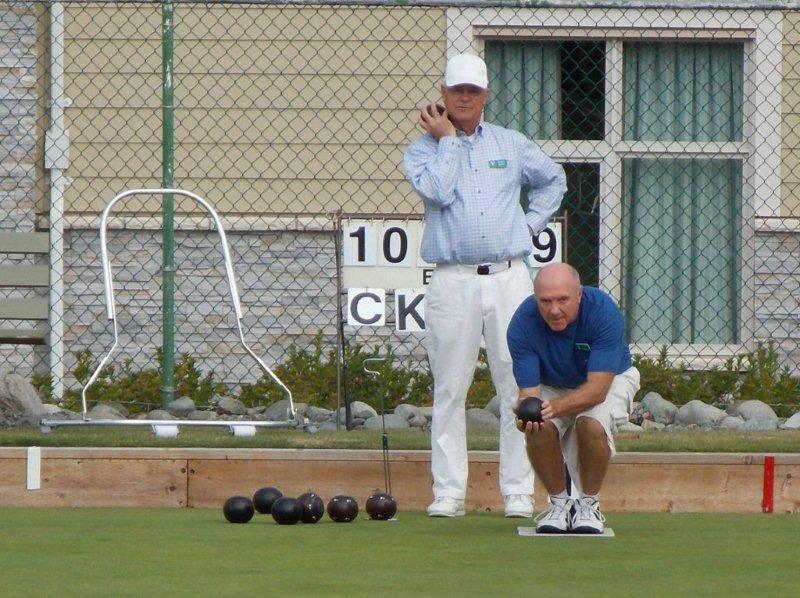 Not sure why Keith Smith is in the picture - but you're always welcome in any pic Keith. 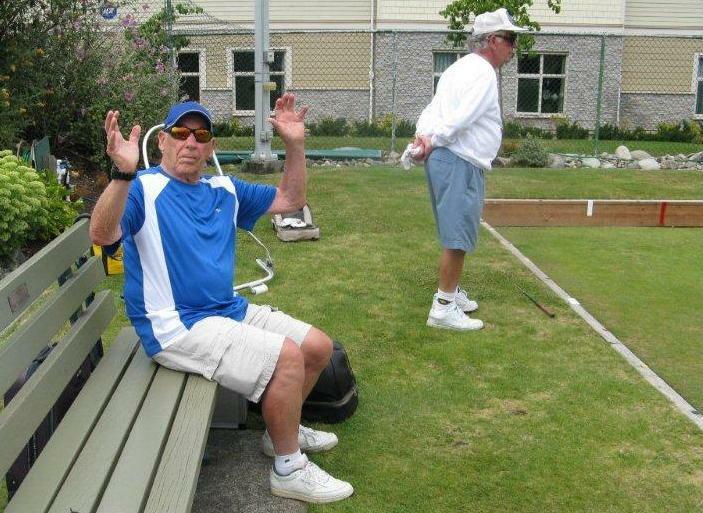 And finally, Pat the birthday boy blows out his candles. 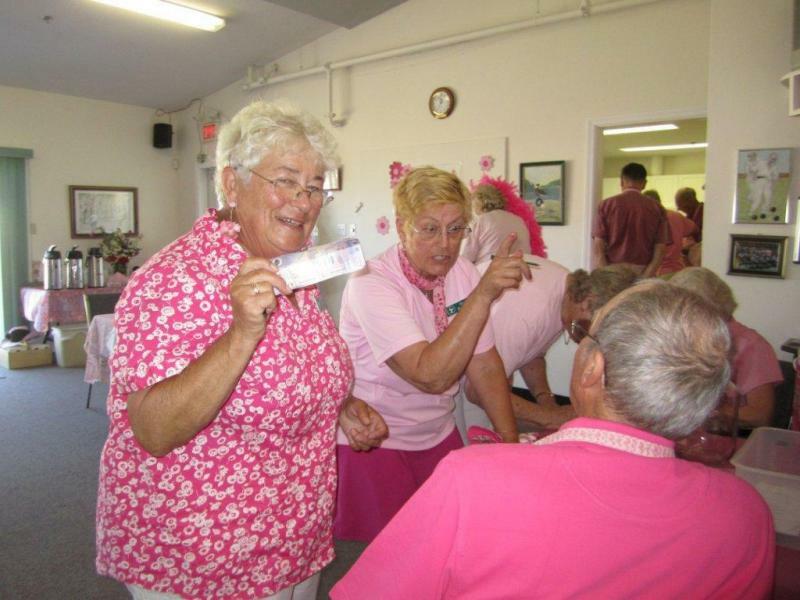 Barb tries to convince Bill gambling is better than fishing. 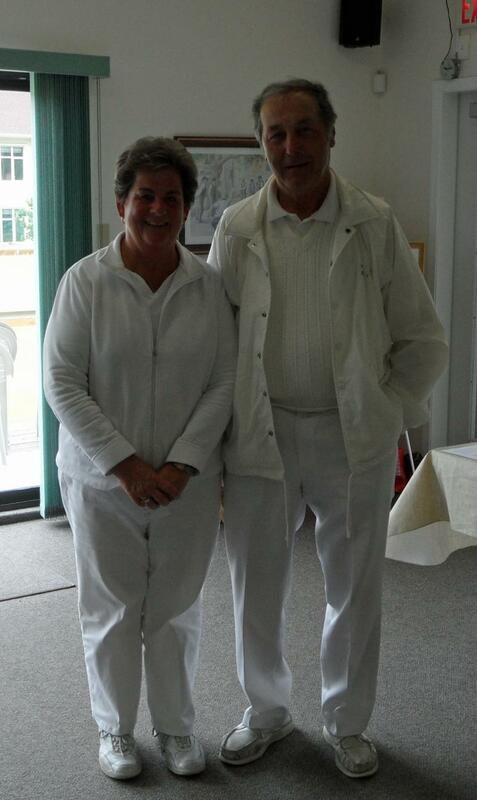 After 35 years together Sandy and Peter are still smiling. 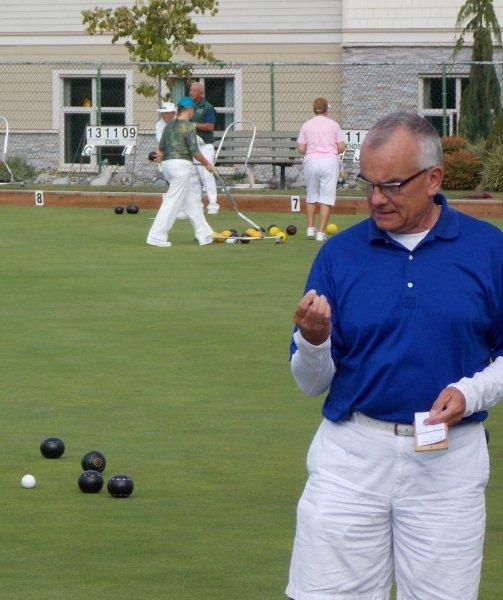 Oh Peter, I can't believe you said that! 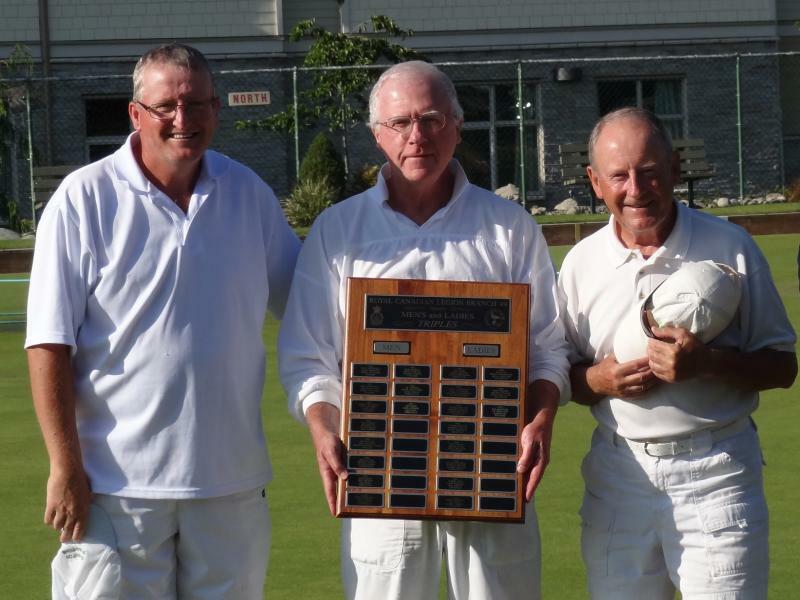 Mens Champion - Stu McNaughton, Pat Kelly presenter. 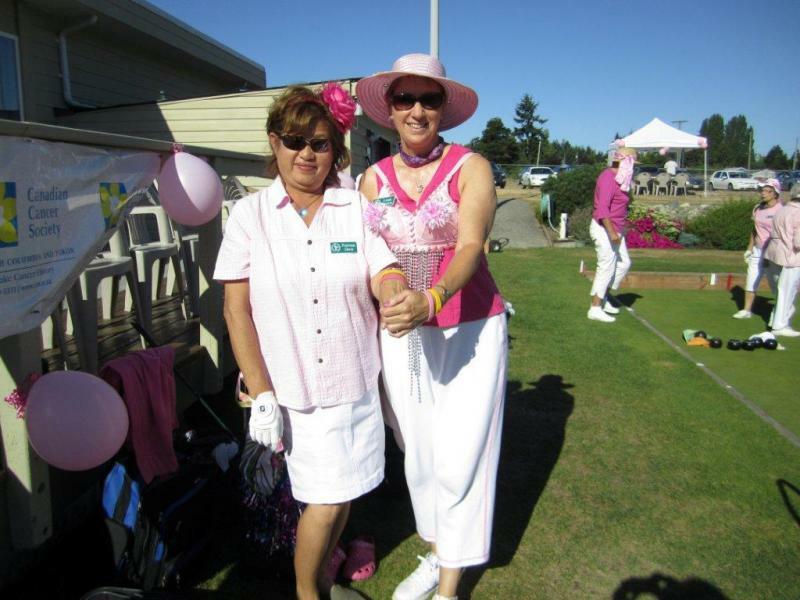 In addition to the selection posted below an additional 500+ photos may be viewed, courtesy of Gloria Wilcox, by clicking here. 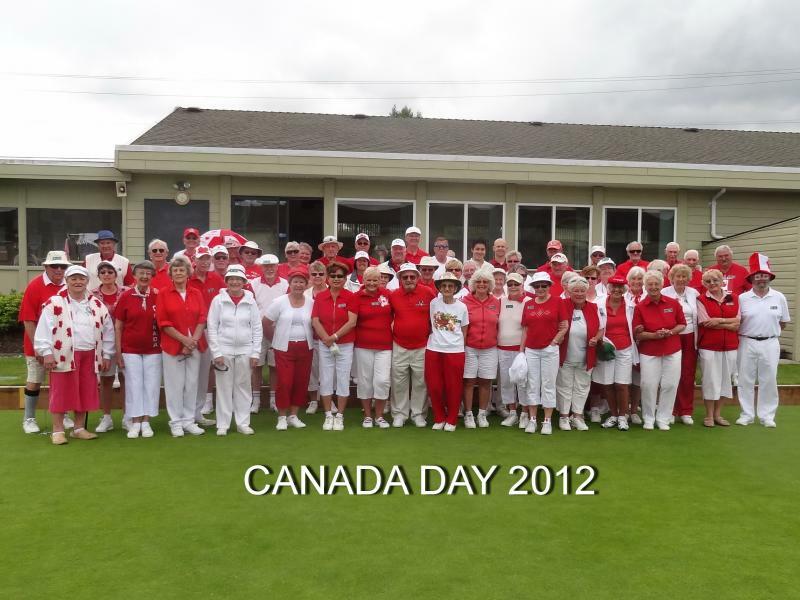 Part 2 - The Games, participants and spectators. 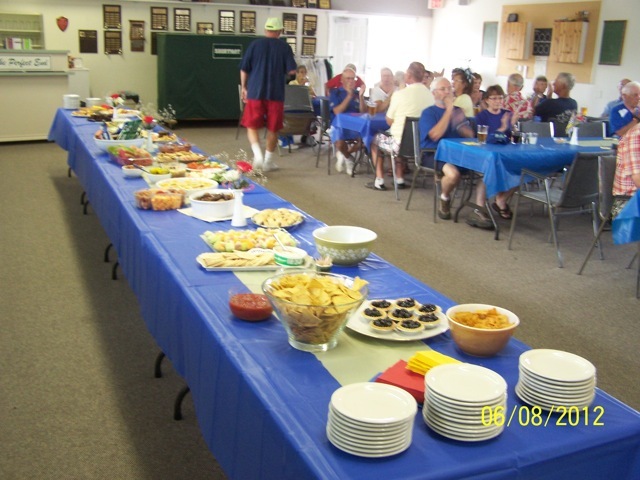 Part 3 - The Lunch, preparers & consumers. 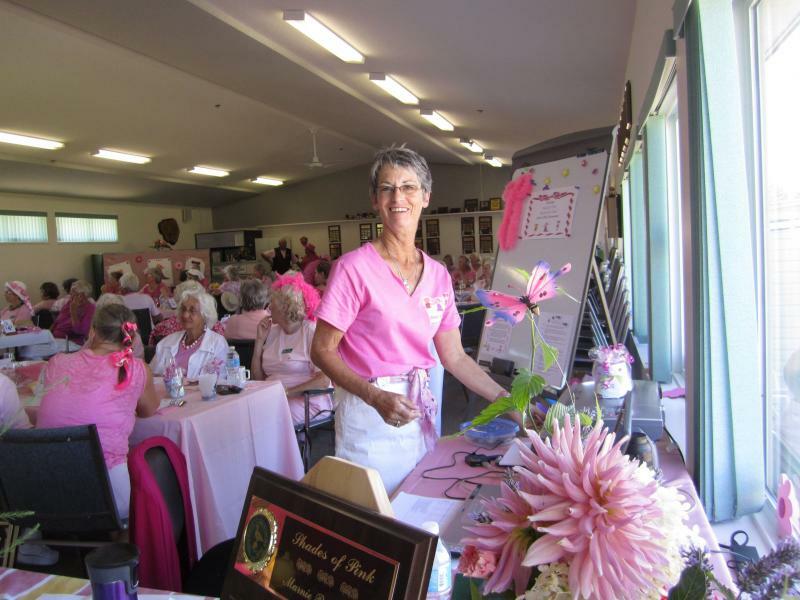 Part 4 - Post-Lunch Activities, including presentations to winners of Marnie Rose Bowl. 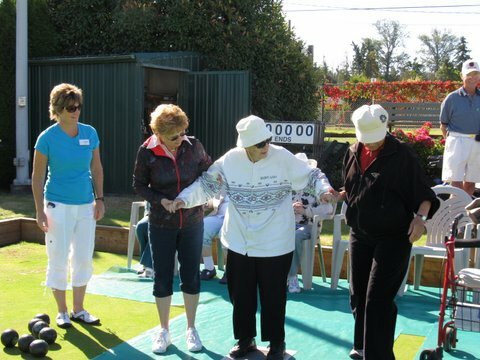 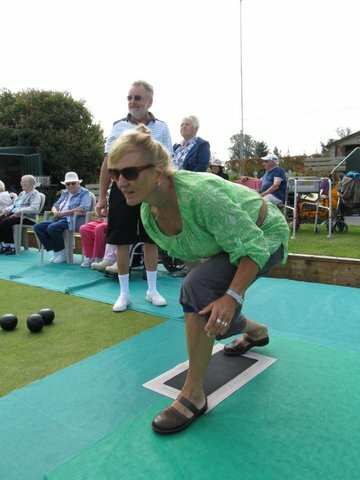 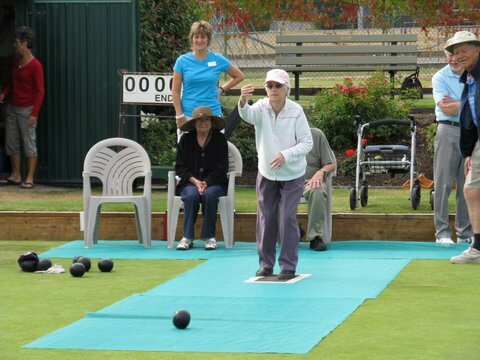 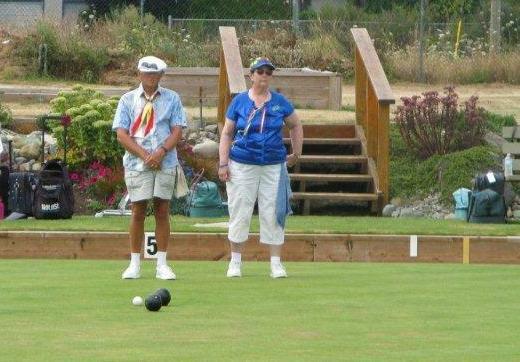 Following months of secret training the Men were triumphant over the Ladies in the three-team, three-ender finale - despite the usual attempts to intimidate. 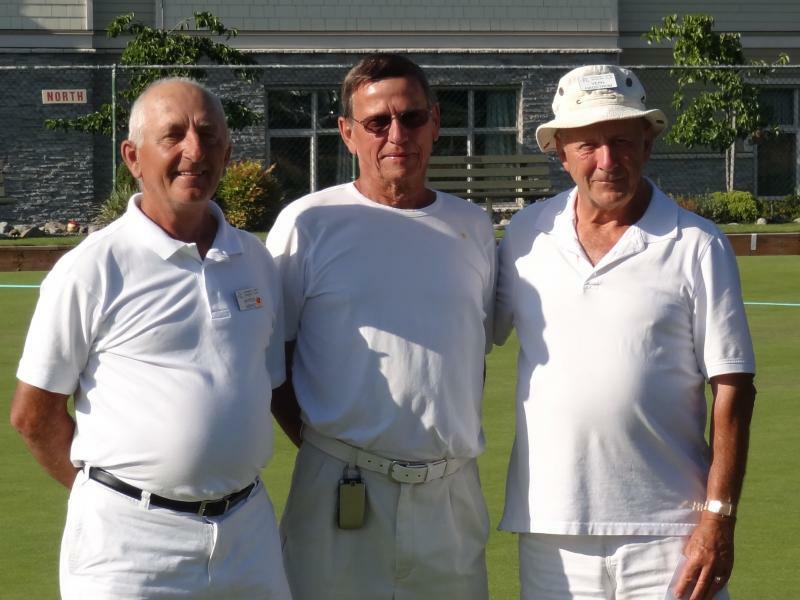 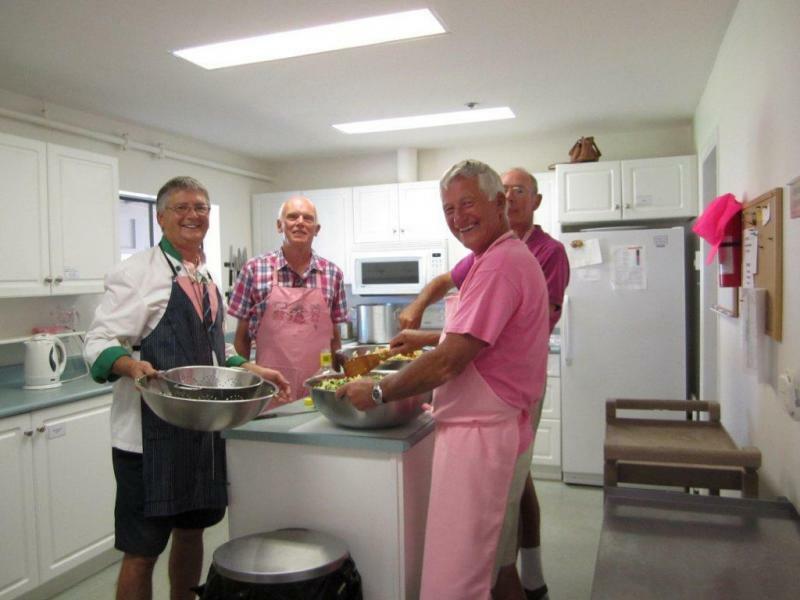 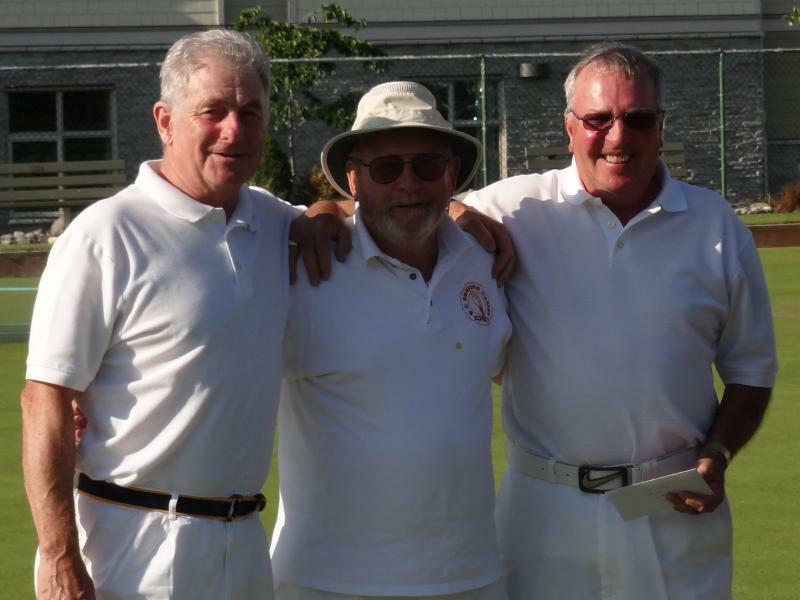 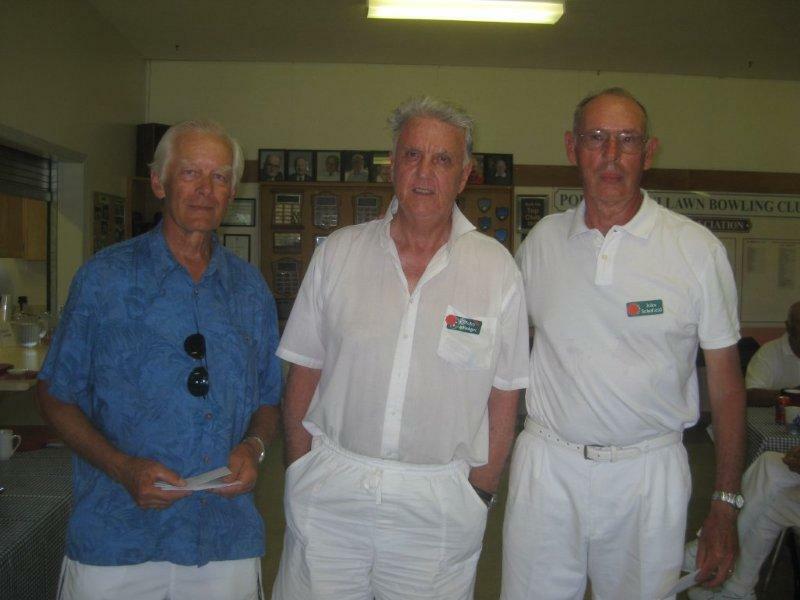 Mens Fourth A - Oliver Fabris, Pat Kelly, John Larner, Don Livingstone presenter. 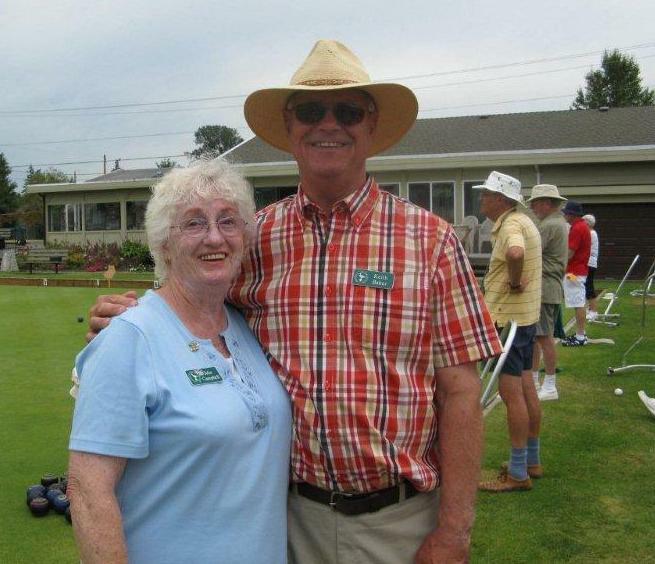 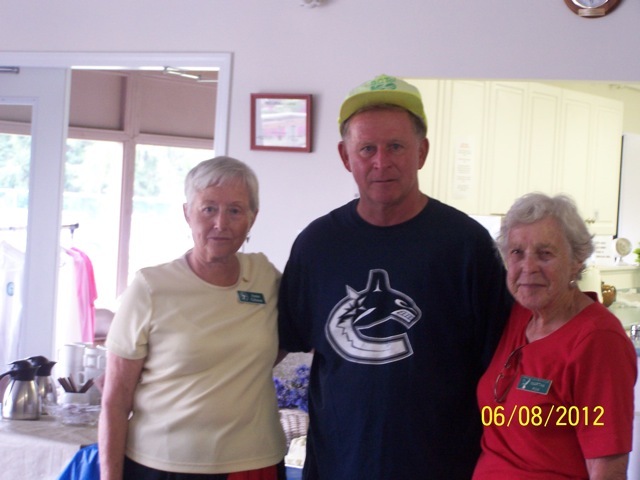 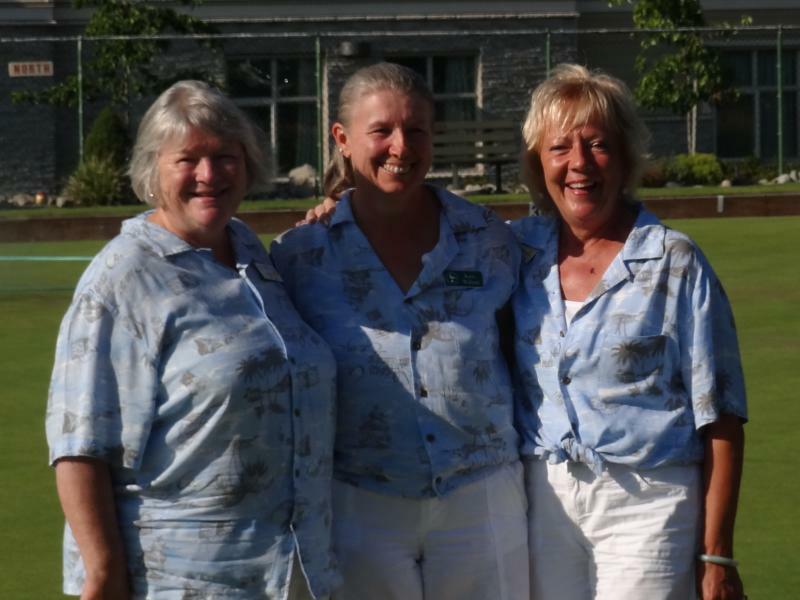 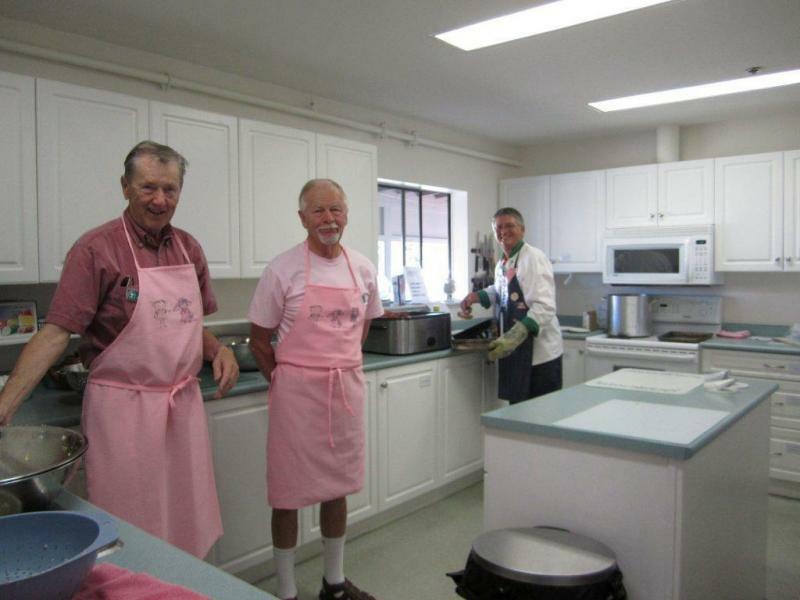 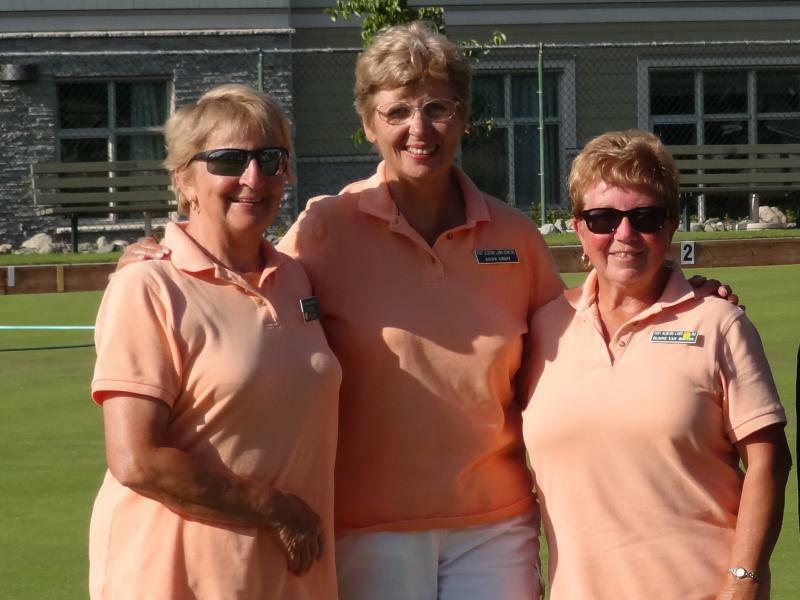 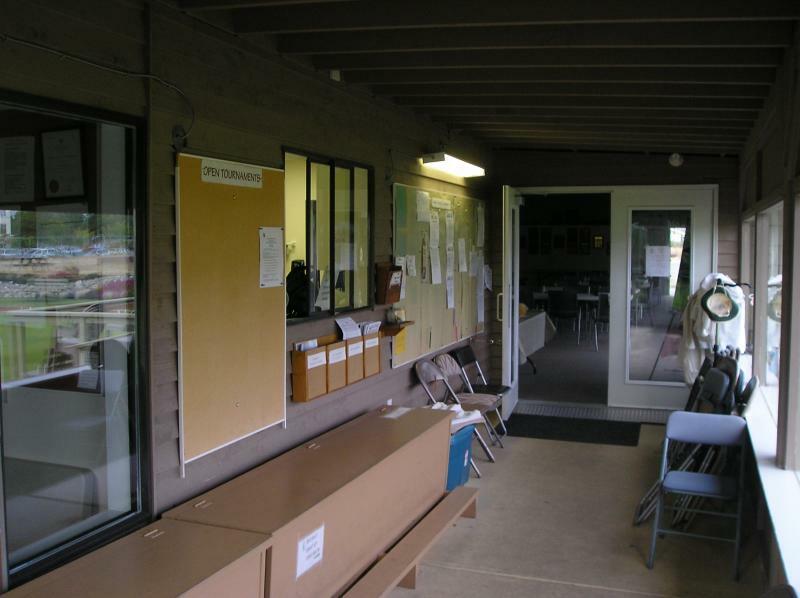 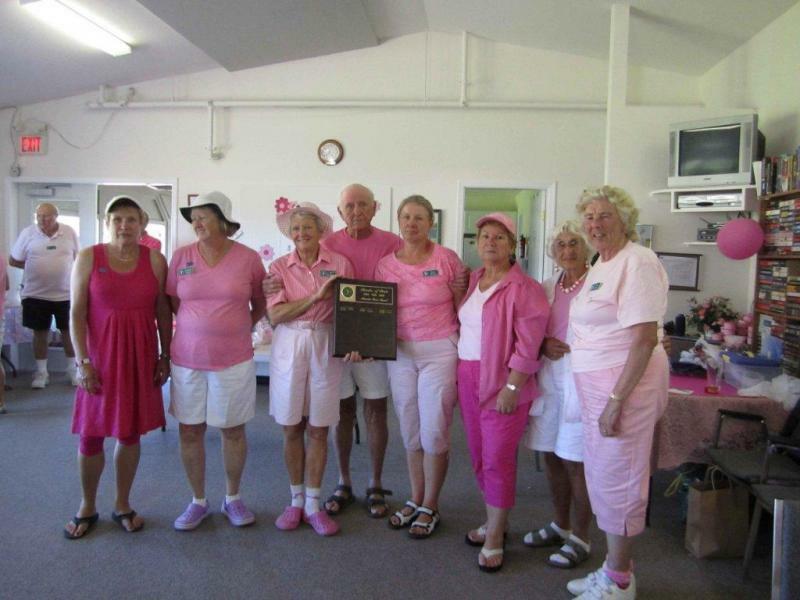 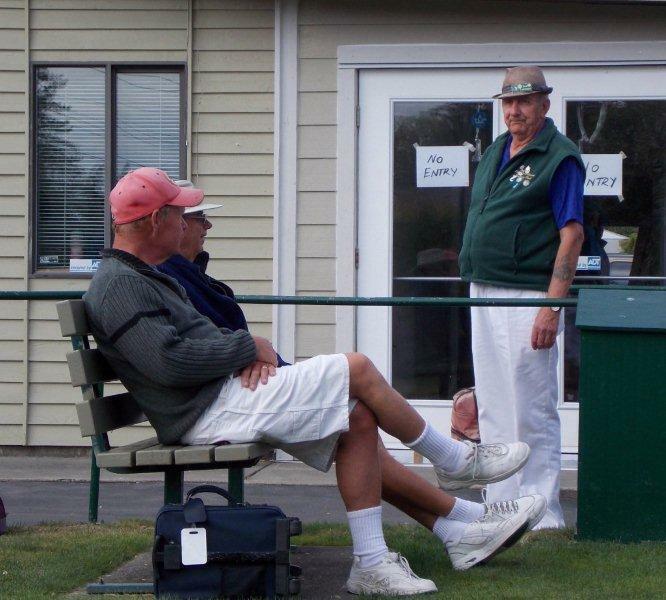 Jack Lawrence, our greenskeeper, who, with his army of volunteer helpers, makes it all possible. 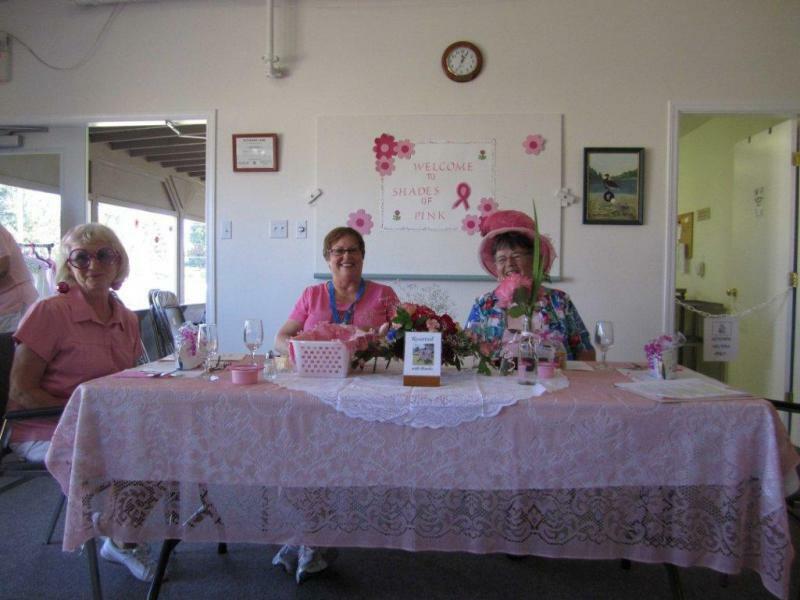 No other photos of this event available. 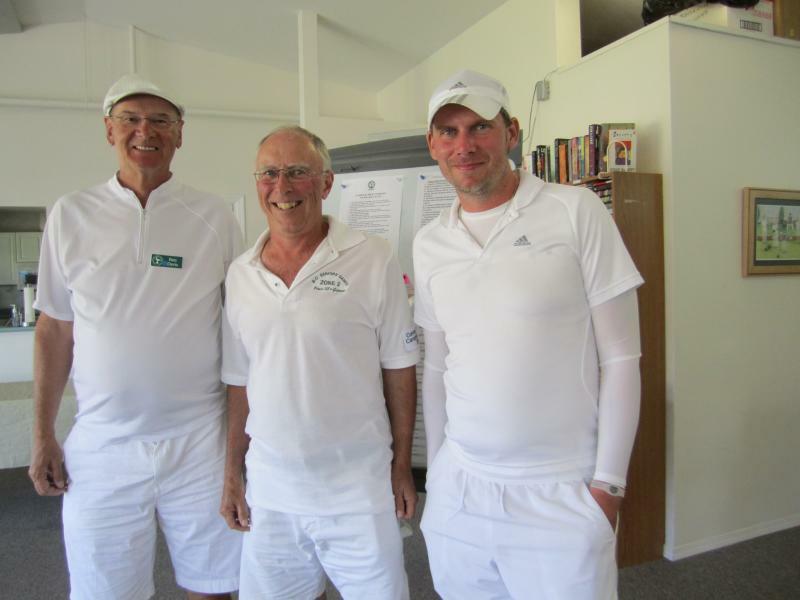 Mens Winners - Alan Brunskill and Keith Baker. 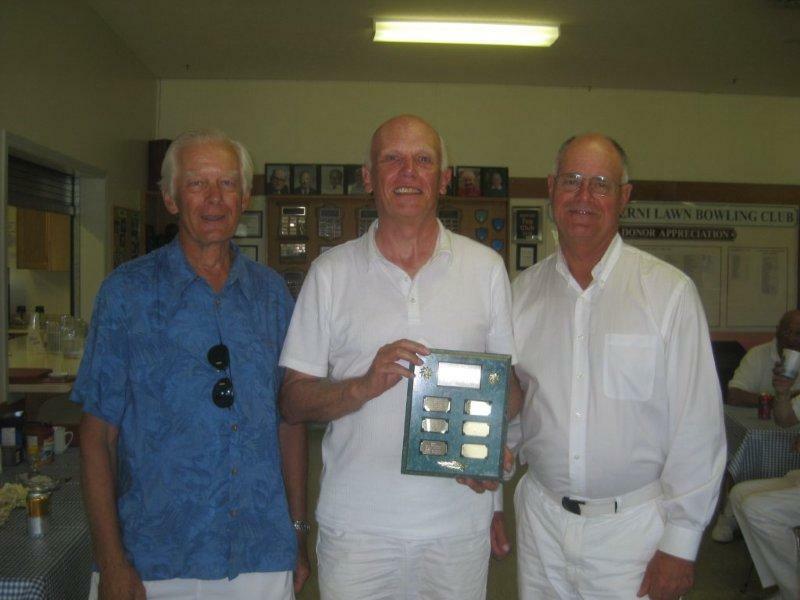 PALBC President Jake vanKooten presented the shield. 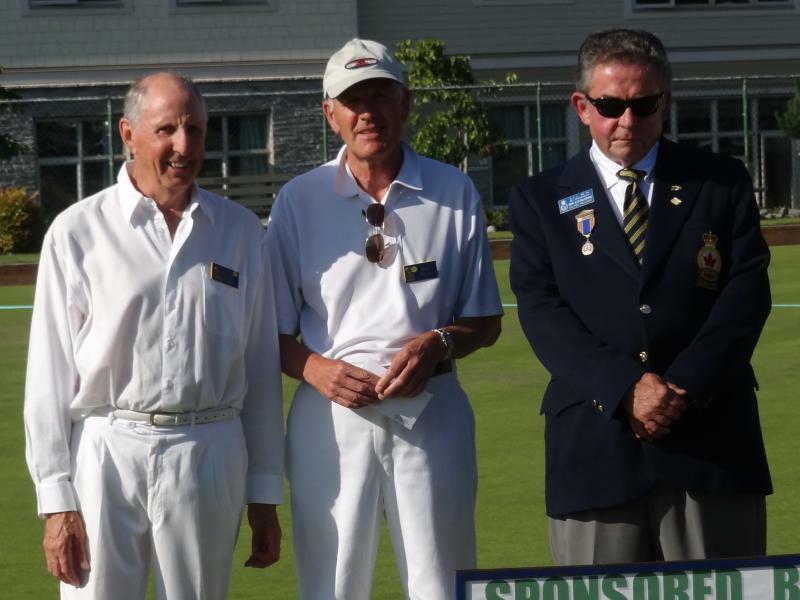 Second place - Art Ferguson & Oliver Fabris. 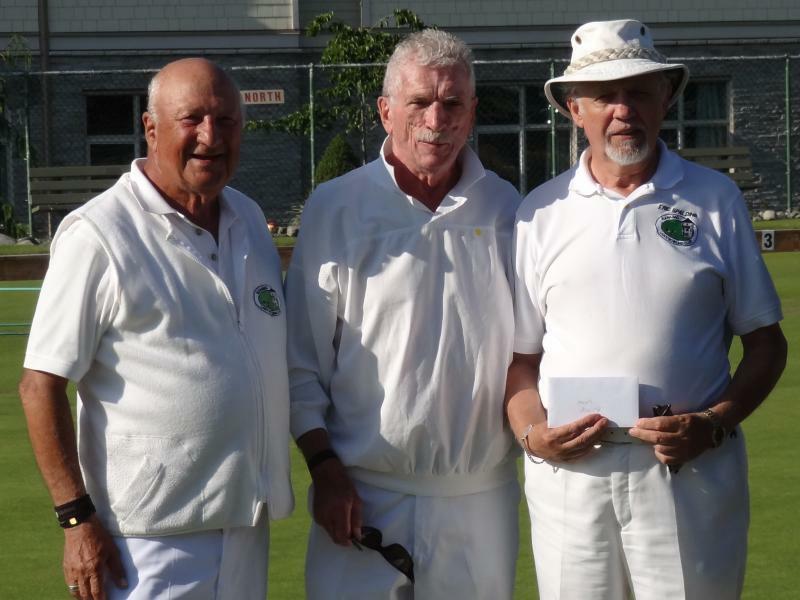 Overall (Group A) winners, Mens and Ladies - Alan and Keith with Courtenay's Pat Cutt and friend. 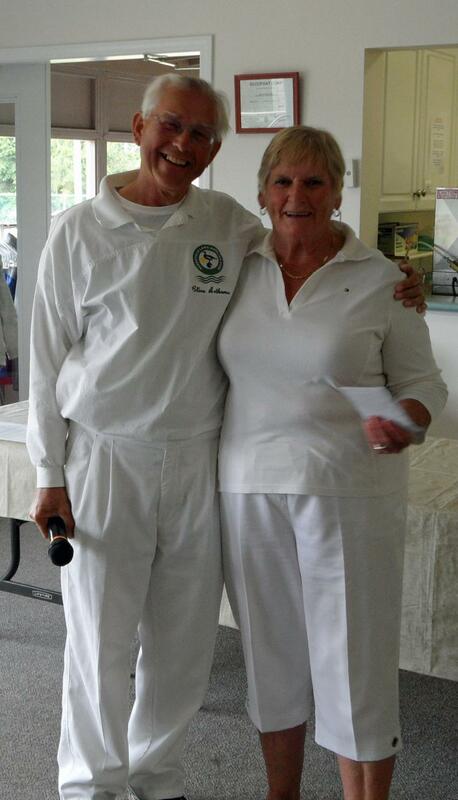 Winners A event & overall - Nanaimo's Tom Renton and Kathleen Sherry. 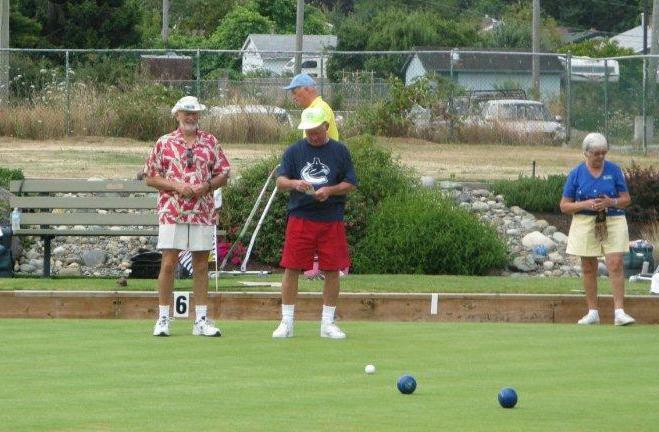 Julian showing his Dad how it's done. 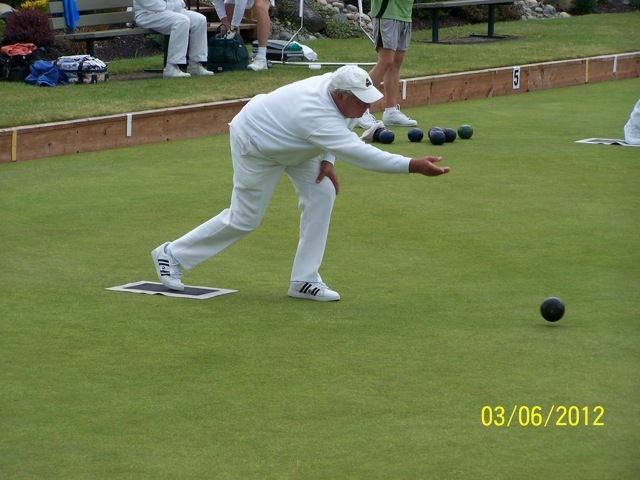 Julian's Dad having a go. 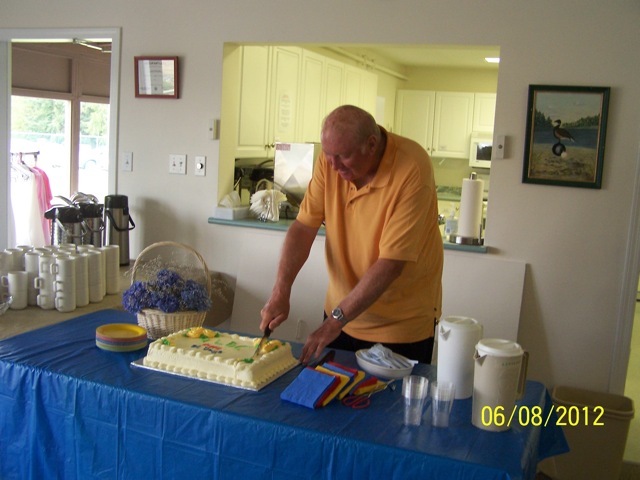 Pat finally cuts the cake. 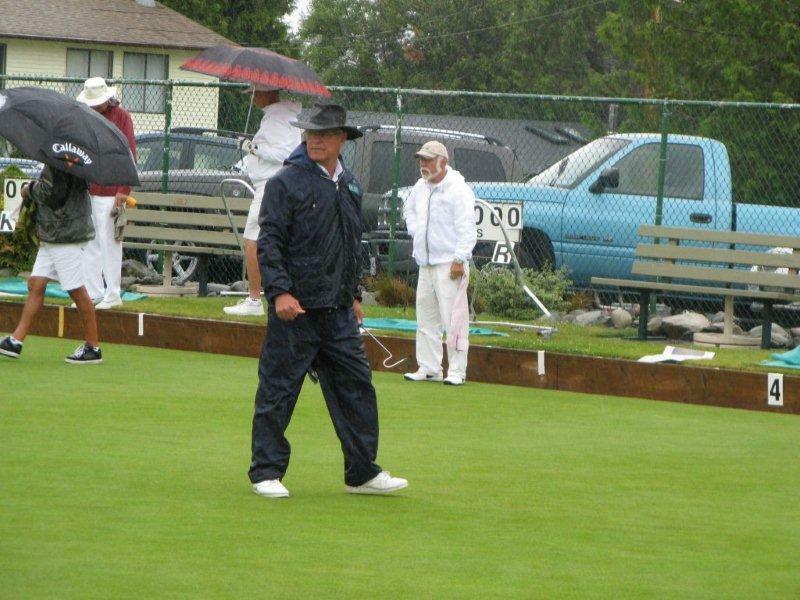 Played under atrocious conditions. 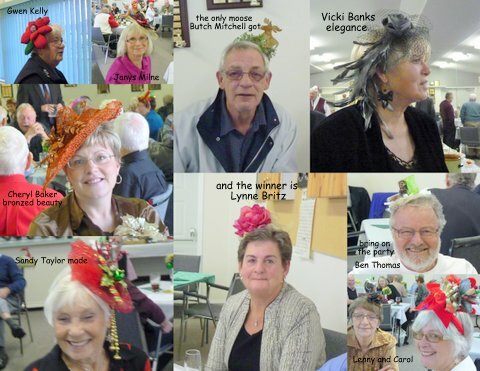 Kudos to all who participated. 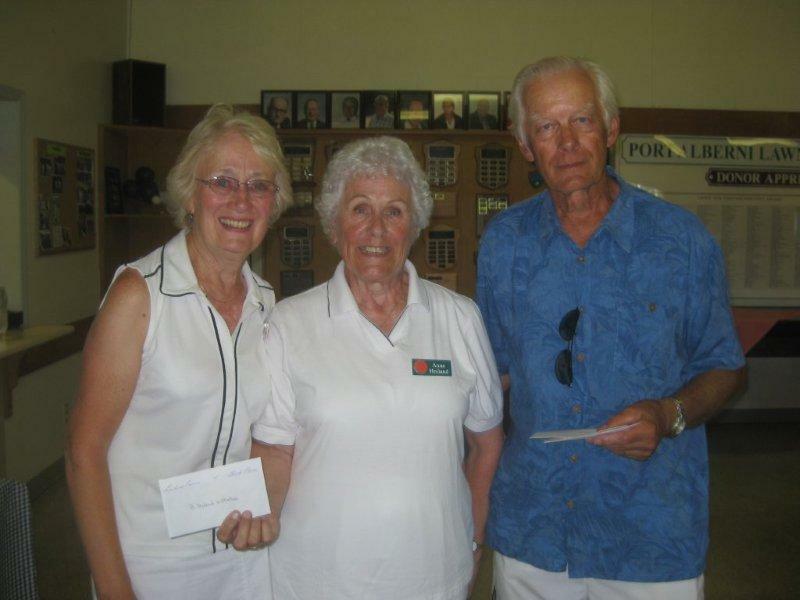 Third in late flight - Carol Bucyk, Doreen Nordentoft, (Bob Hollier). 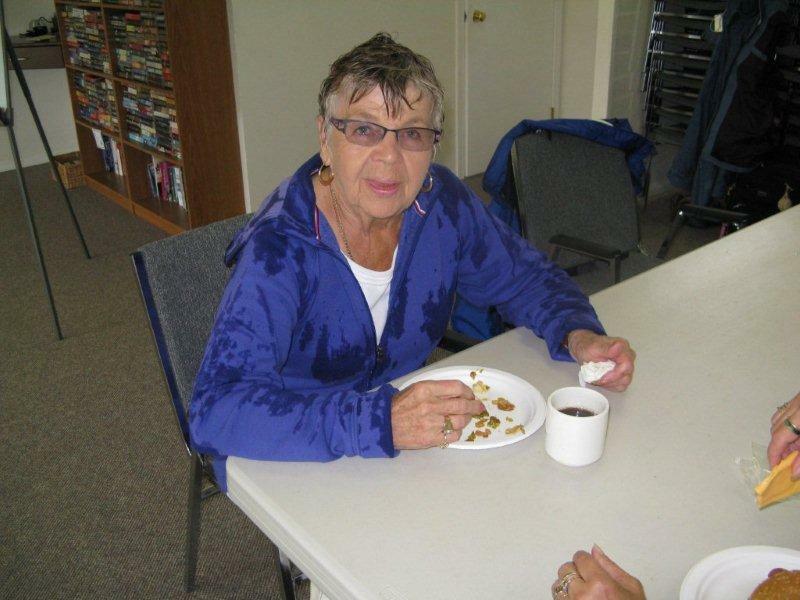 Doreen also won the prize for the wettest player. 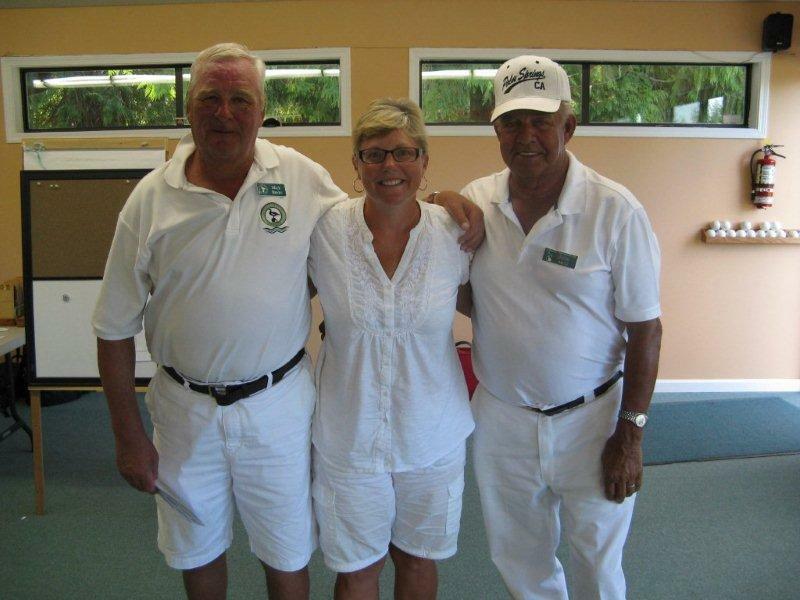 Third in early flight - John Larner, Jerry Whitney, (Susan Paterson). 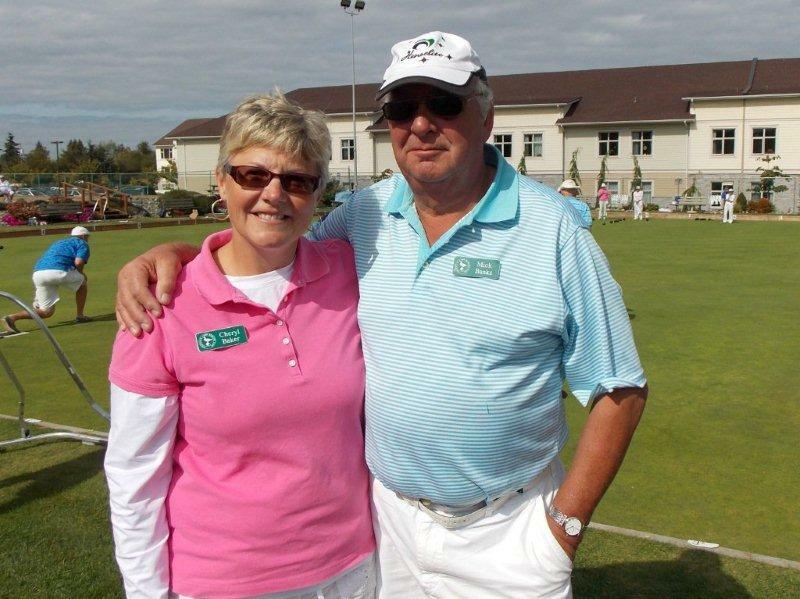 Mixed Pairs Evening League, May/June, final playoff. 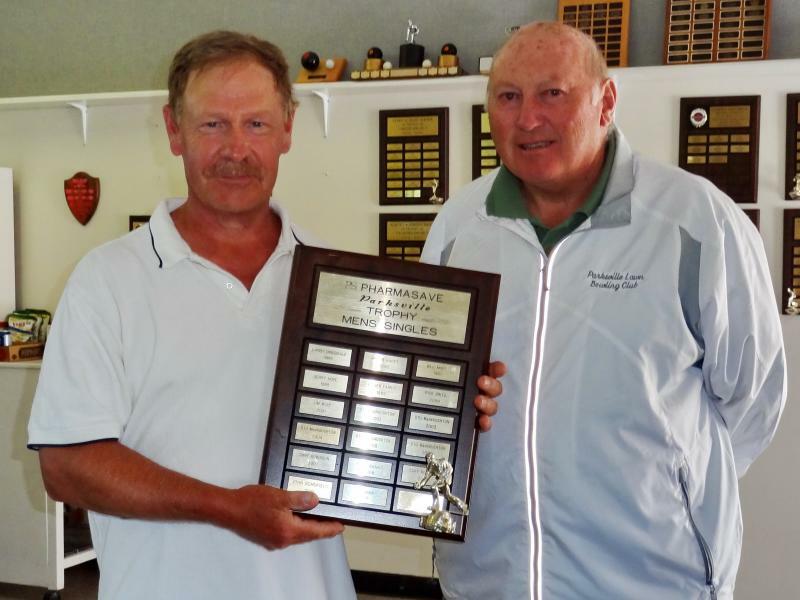 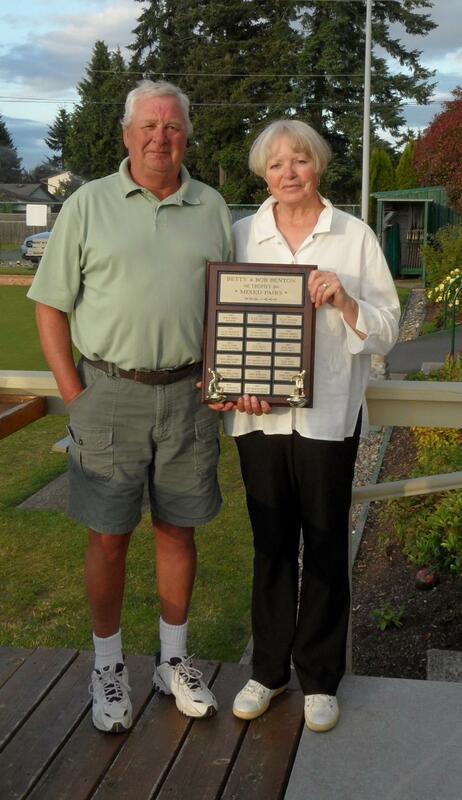 Winning club President Pat Kelly accepting the trophy from Jake Van Kooten ,President of the Port Alberni Club). 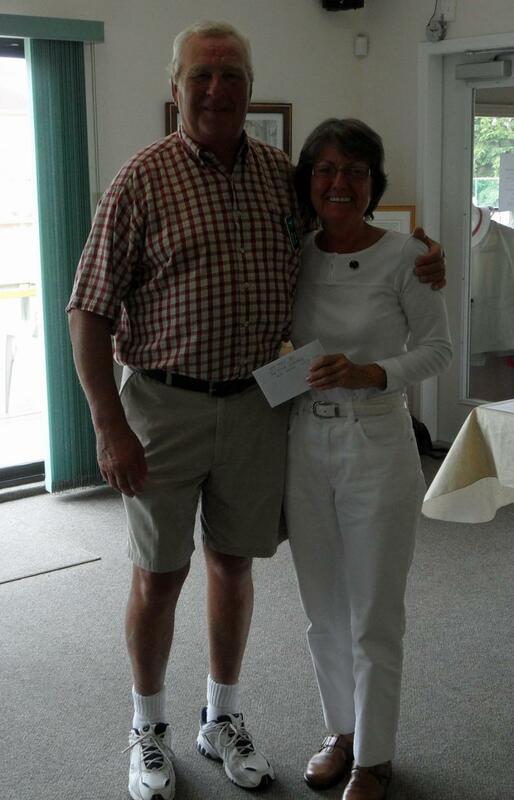 Second Place Late Draw - Diana Olenick and (Brian Michell). 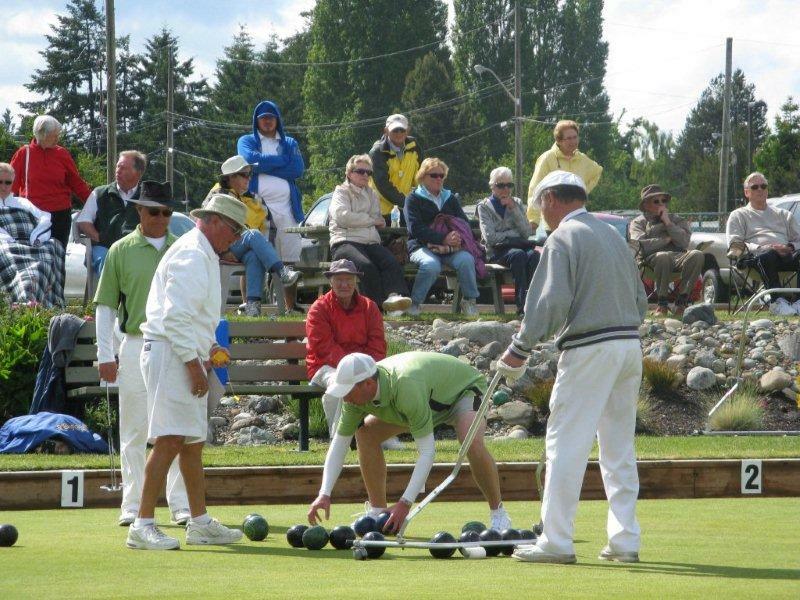 Seasoil Classic, June 1,2 & 3. 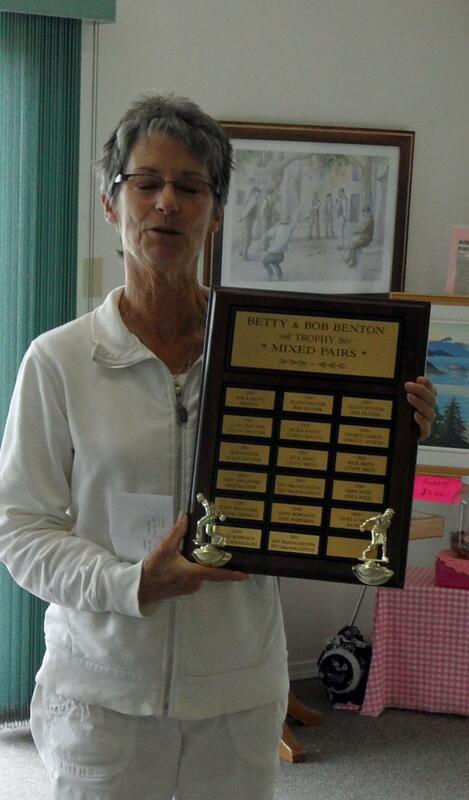 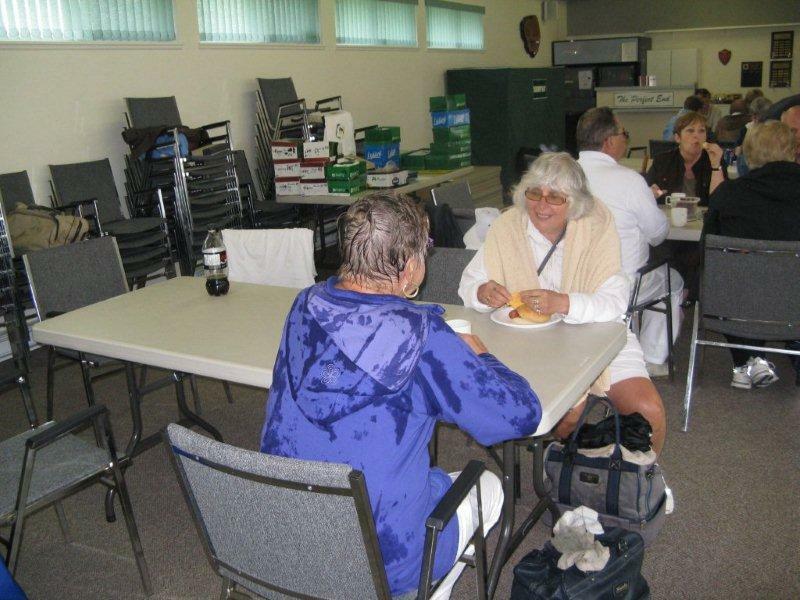 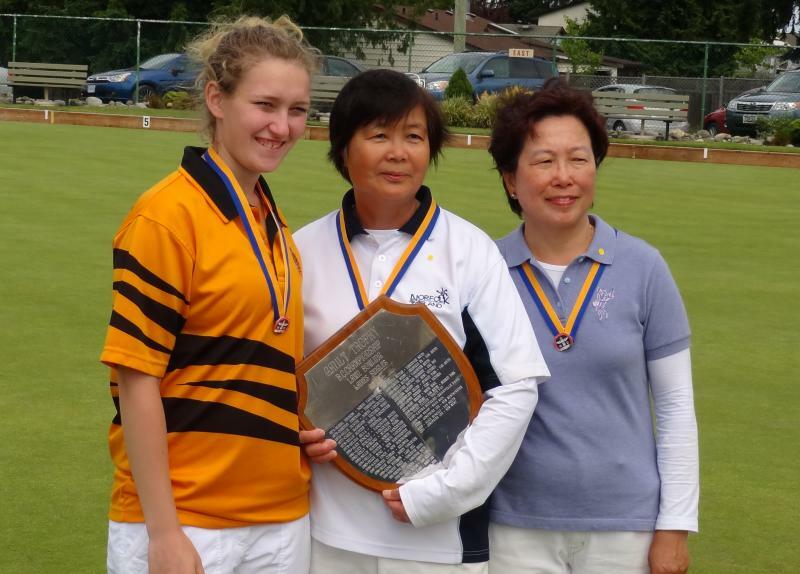 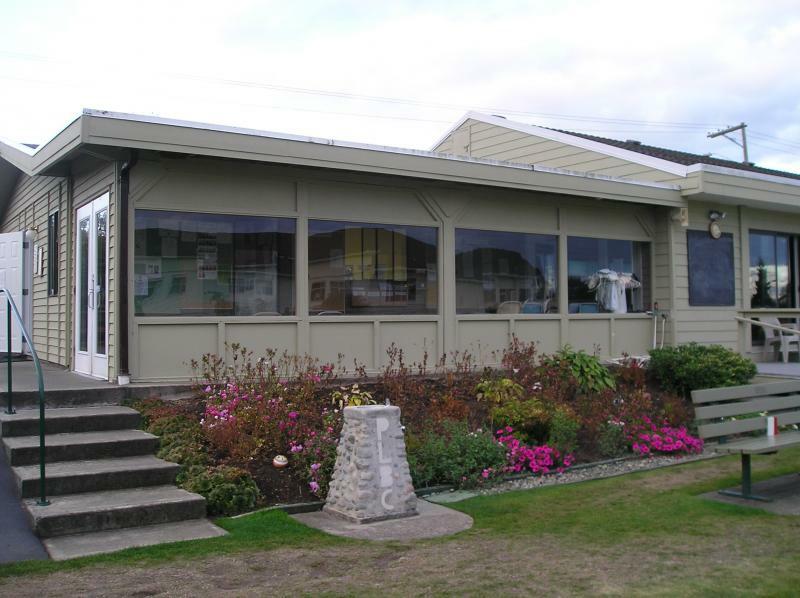 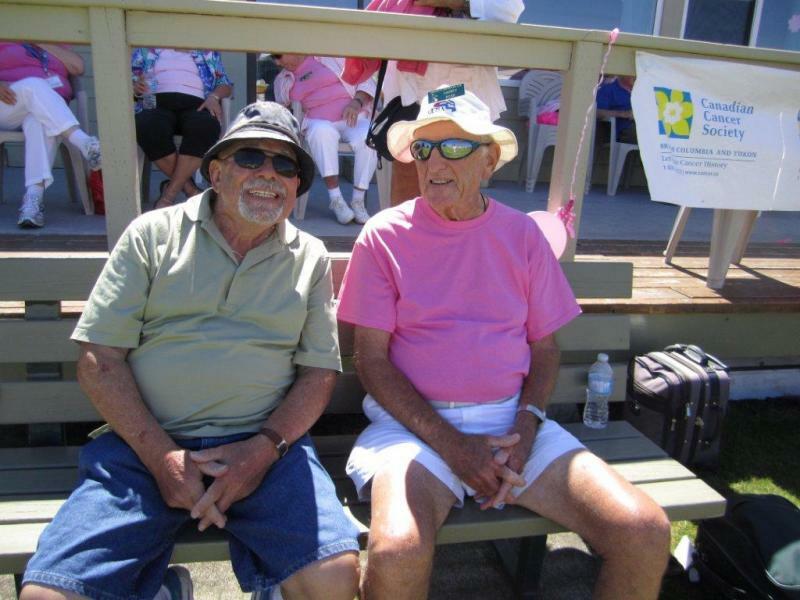 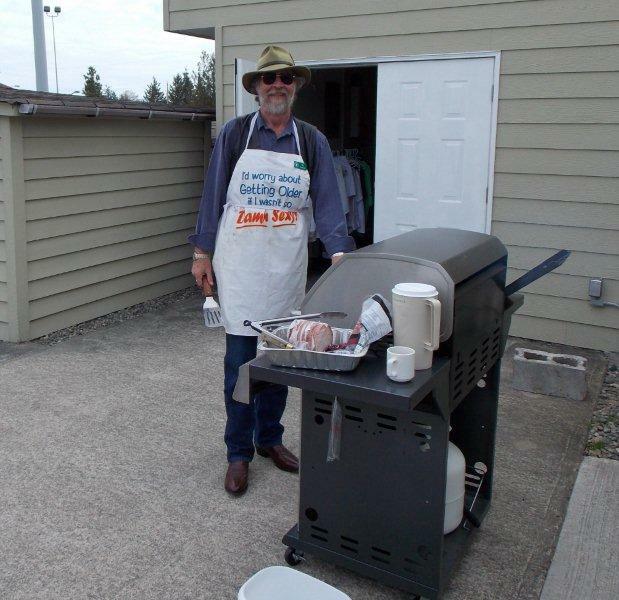 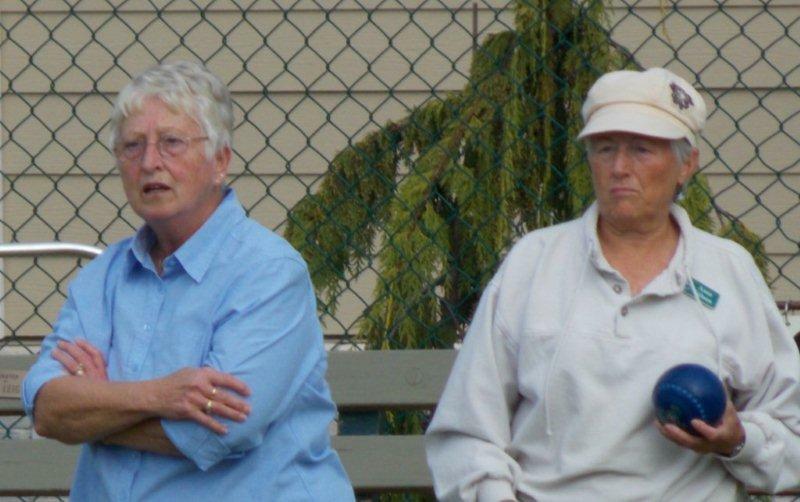 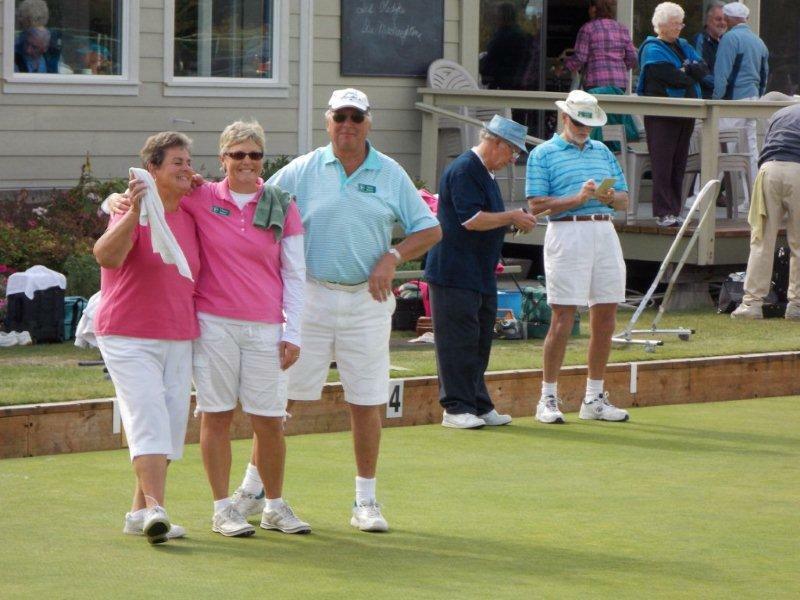 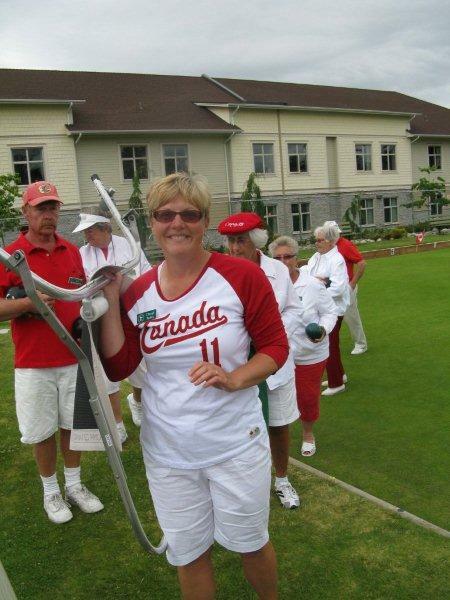 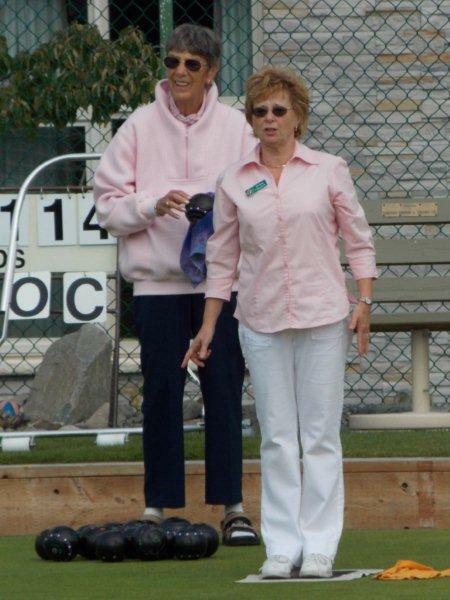 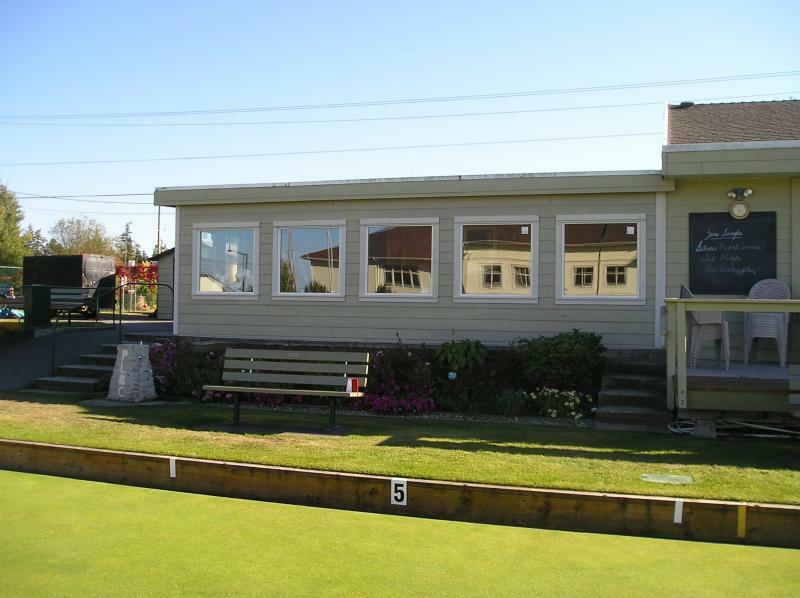 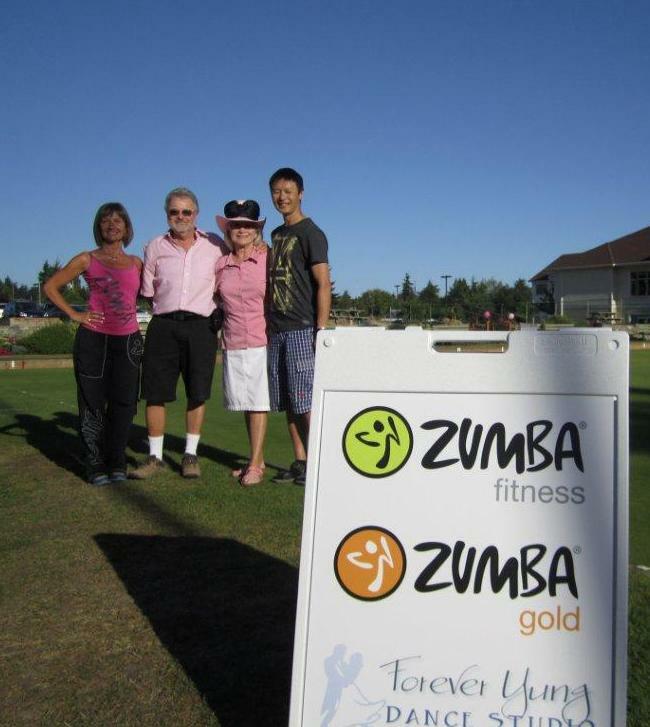 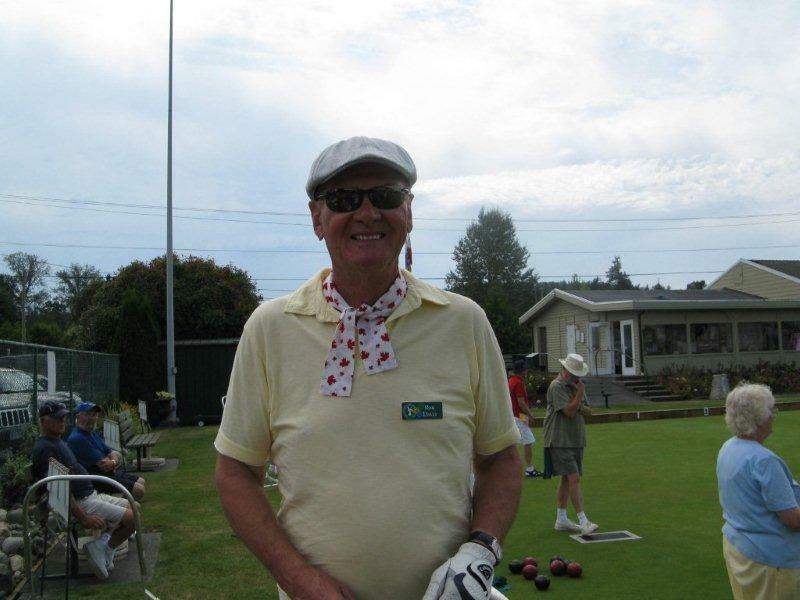 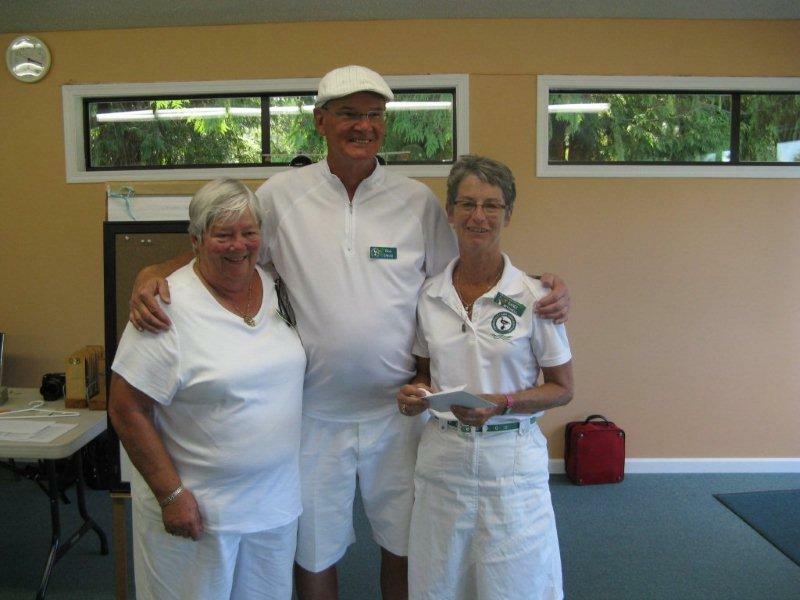 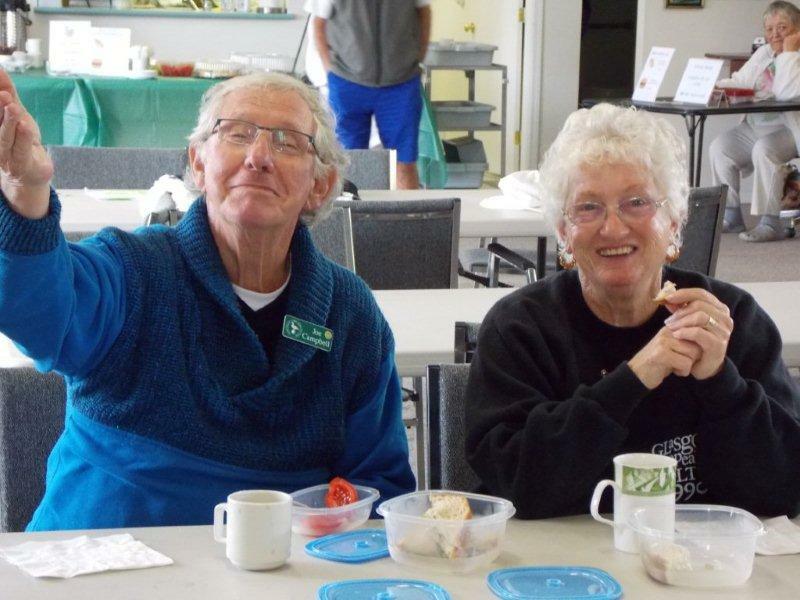 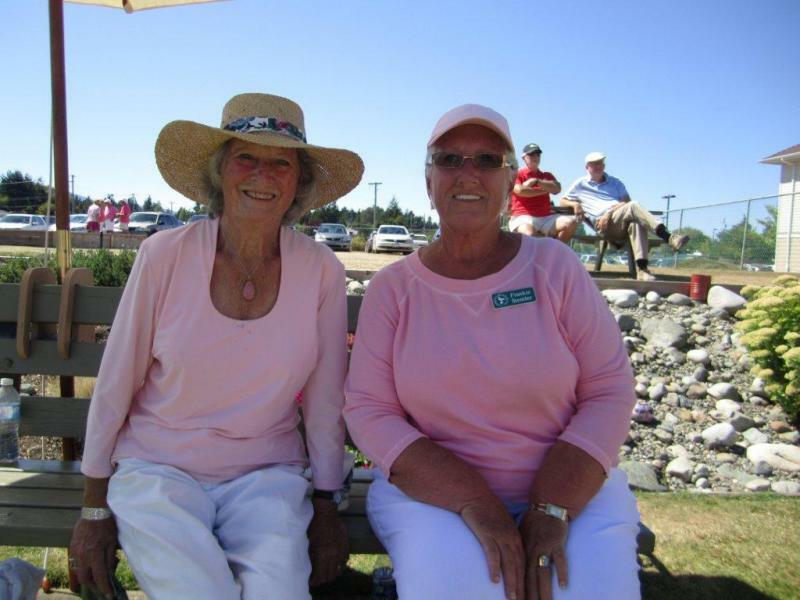 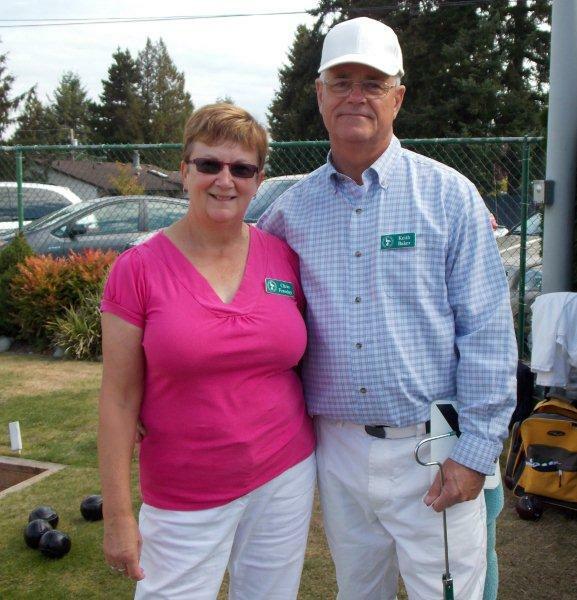 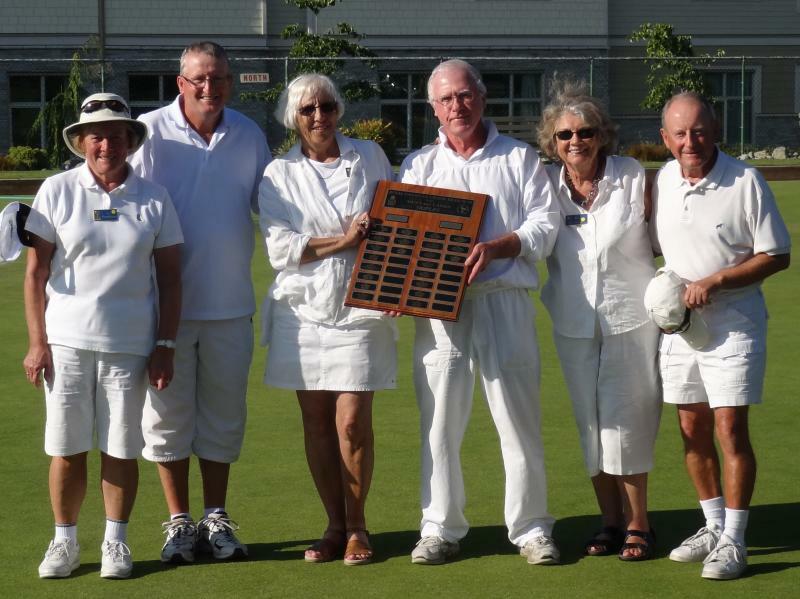 Derek & Janet Shandley Mixed Triples, Nanaimo, May 5 & 6th. 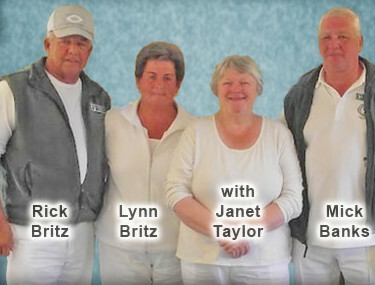 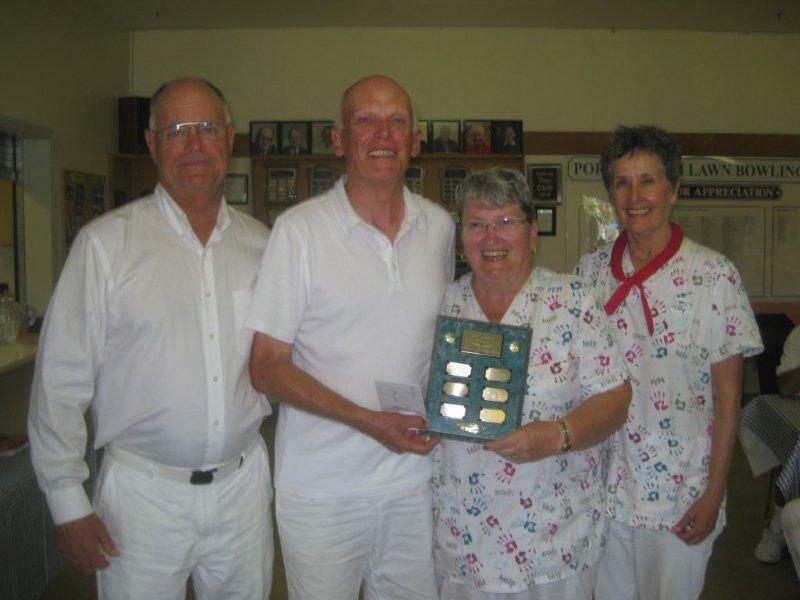 Third place - Rick & Lynn Britz, Mick Banks, with Nanaimo Bowling Club President Janet Taylor. 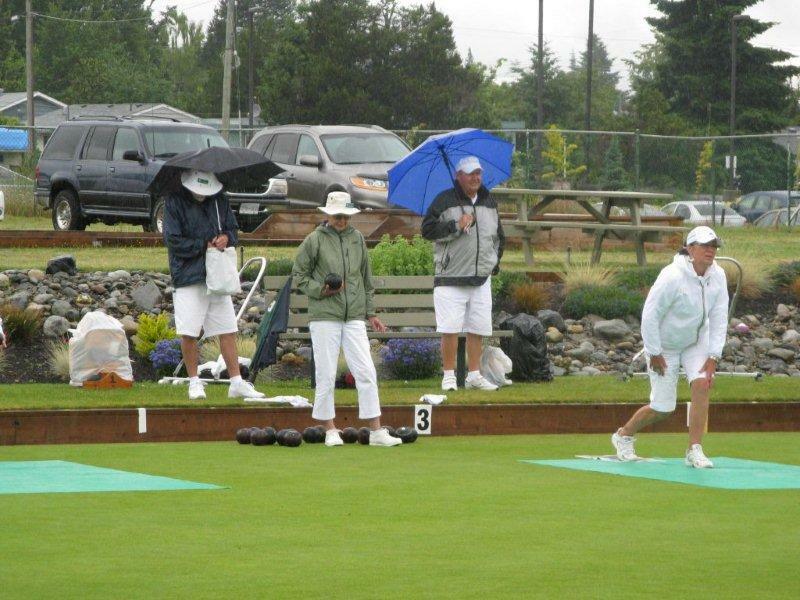 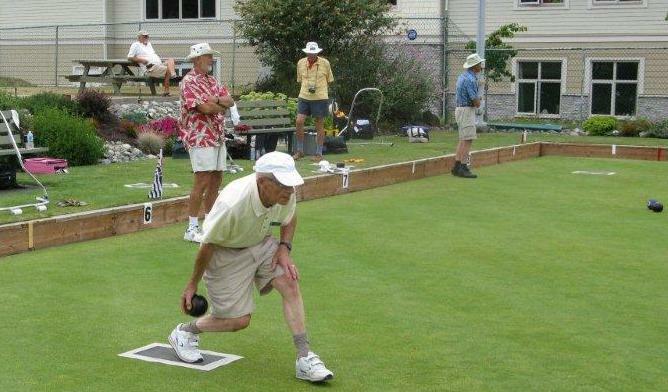 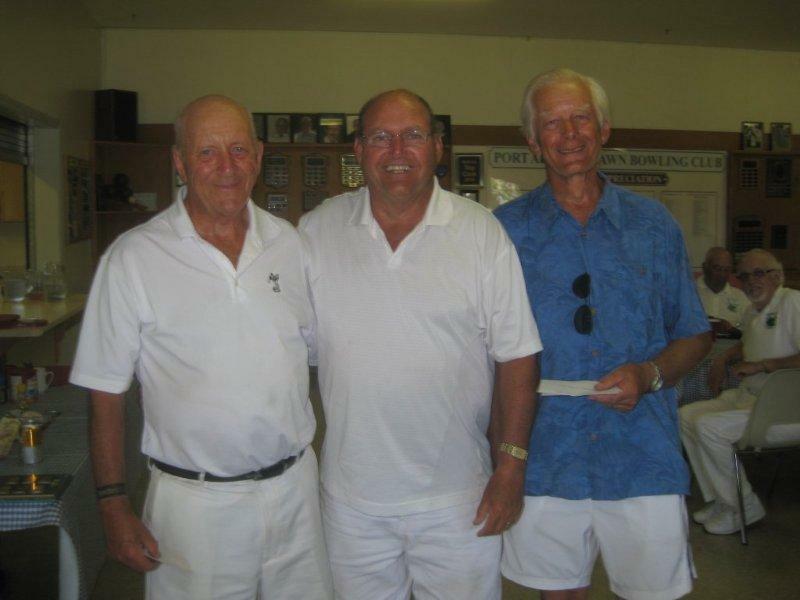 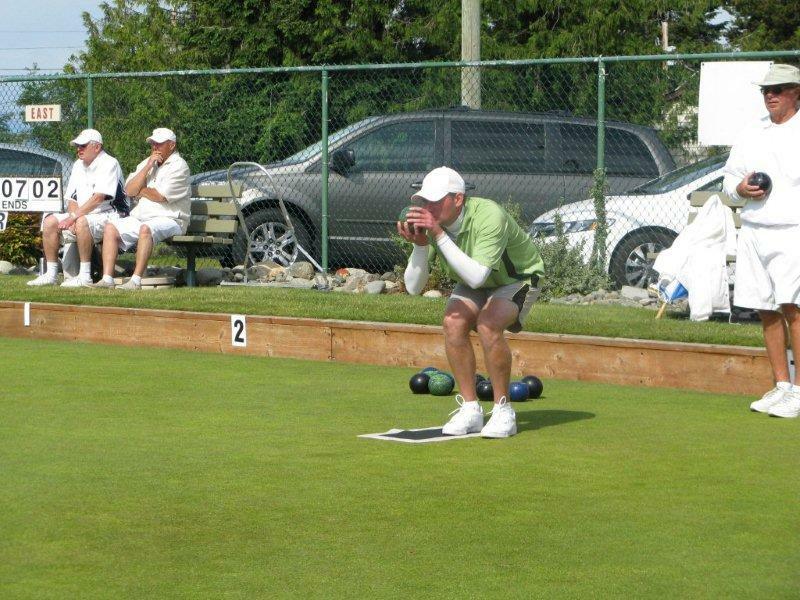 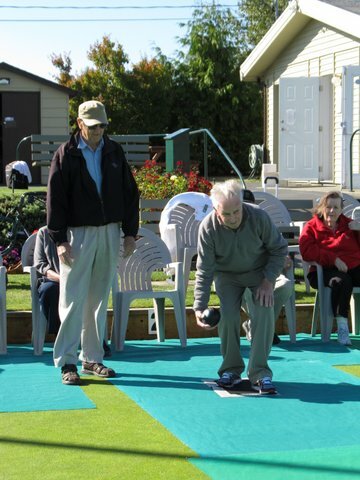 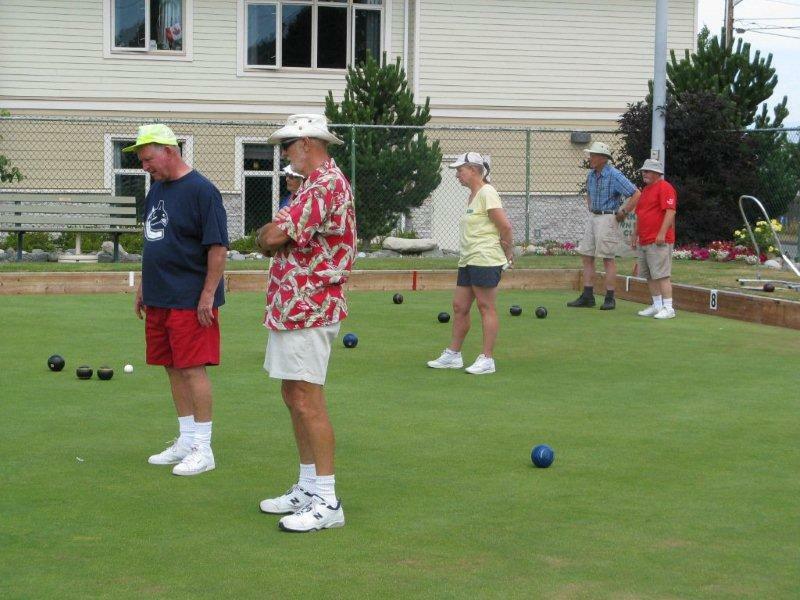 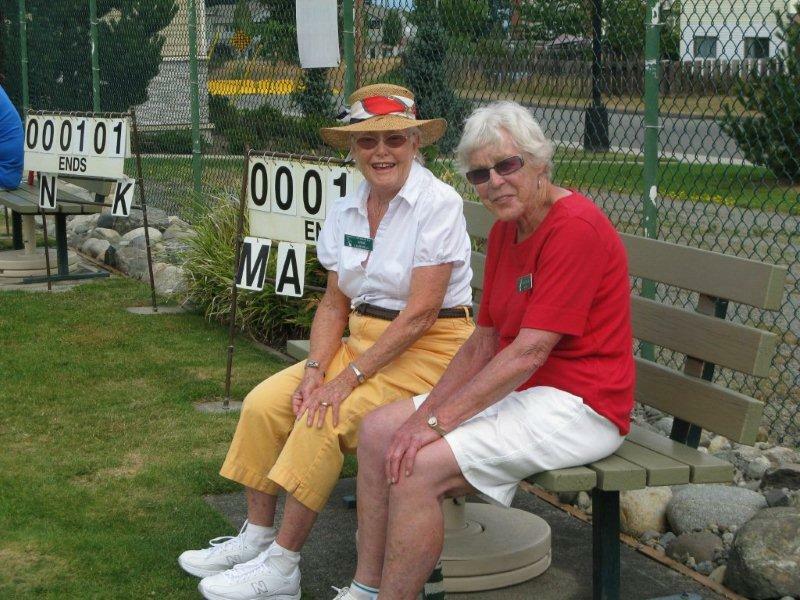 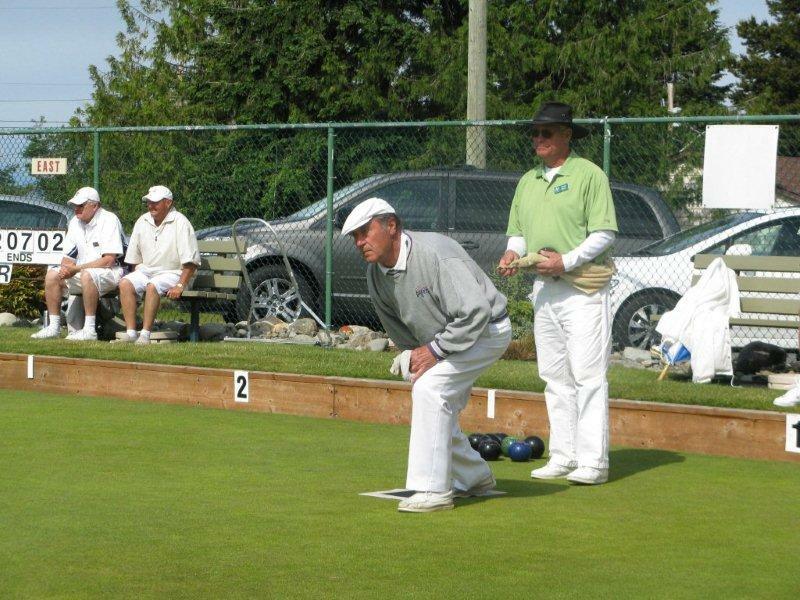 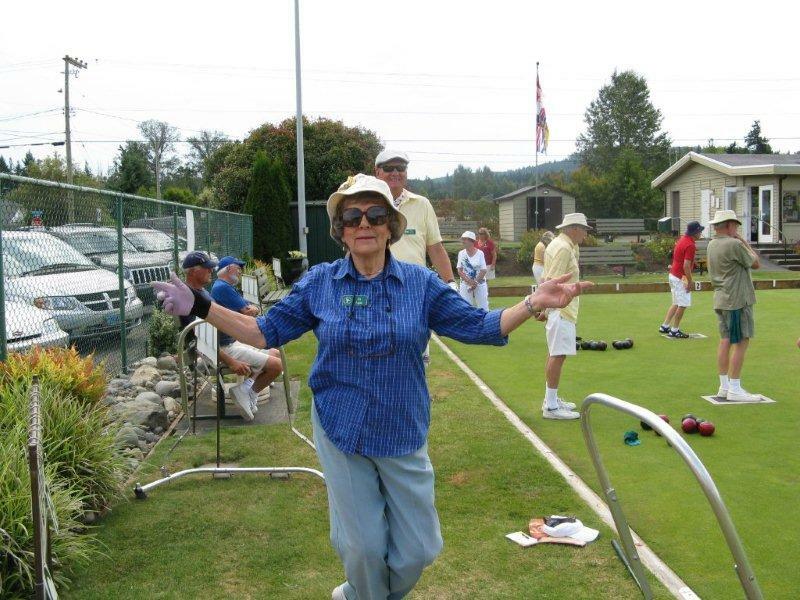 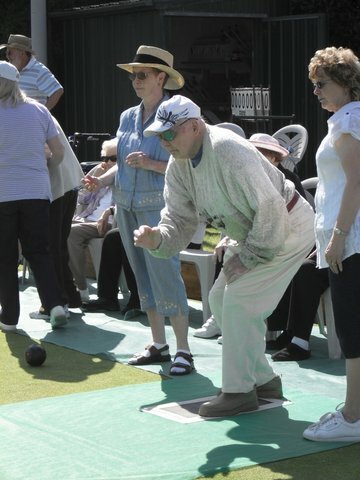 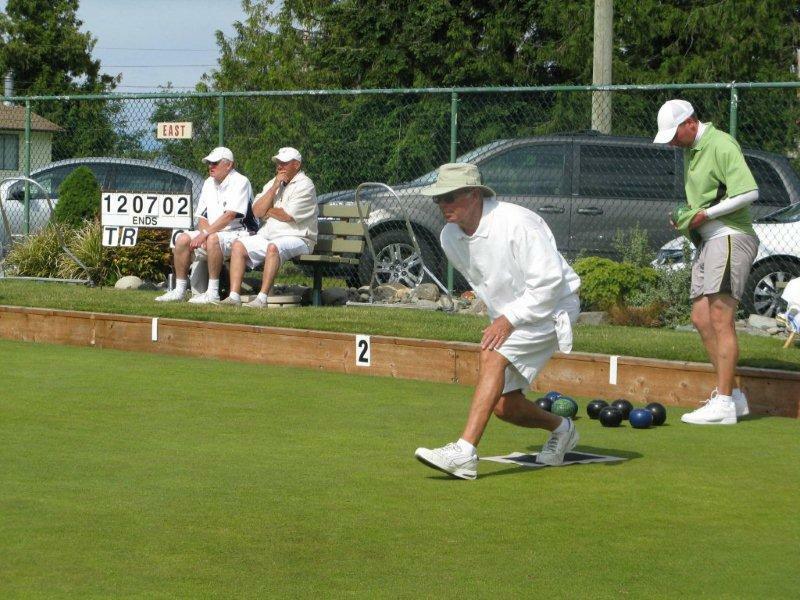 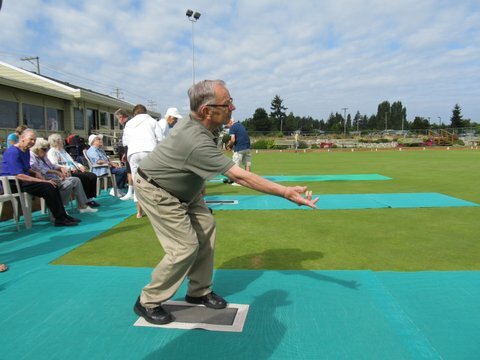 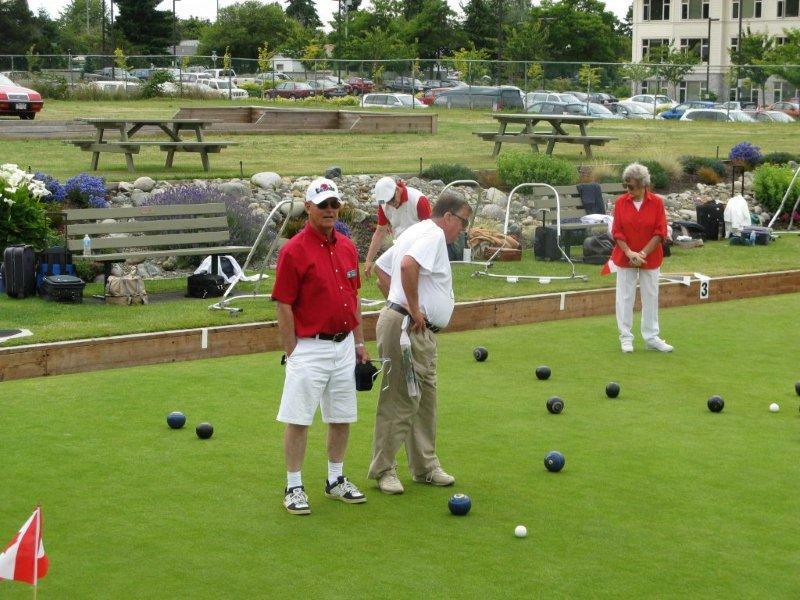 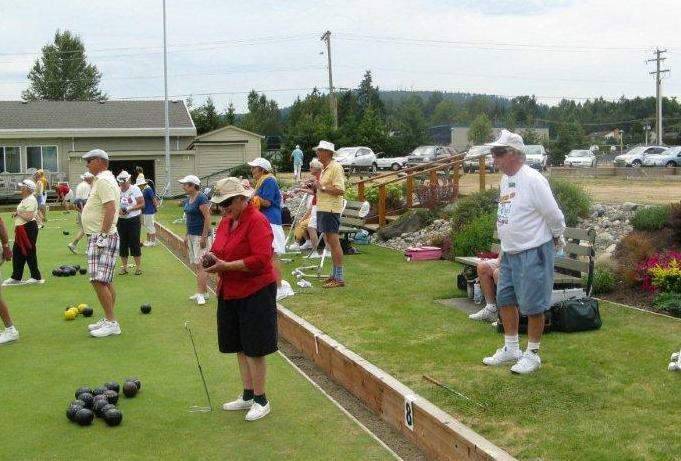 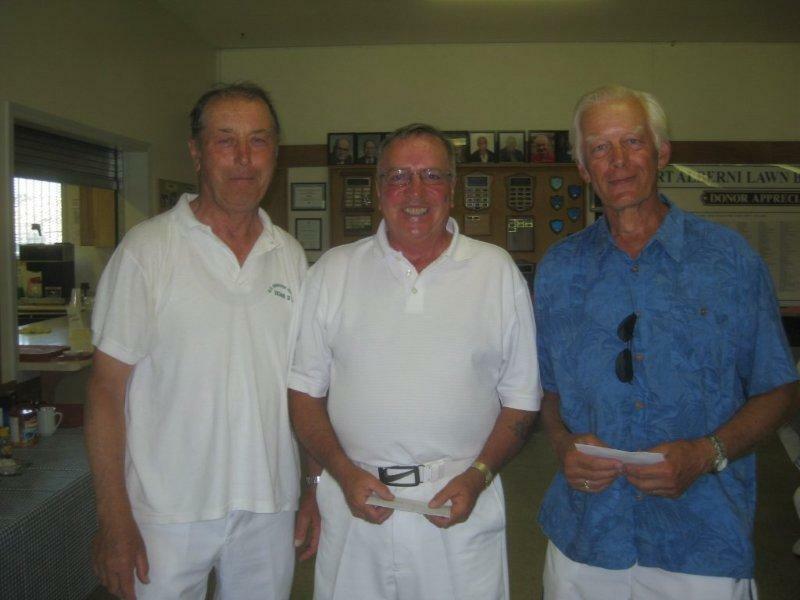 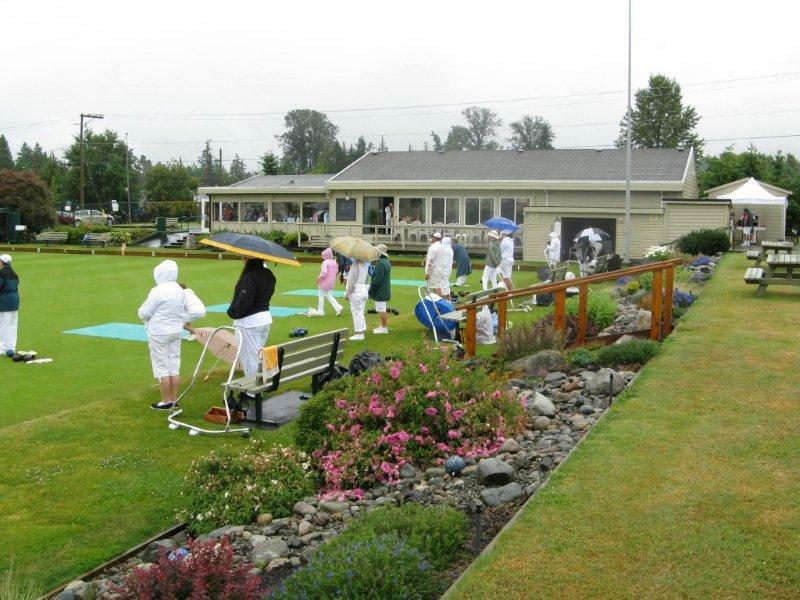 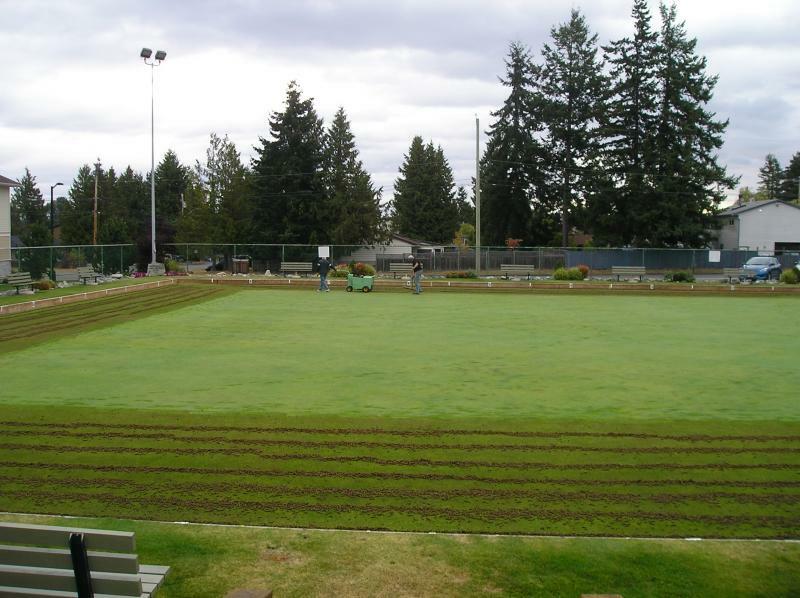 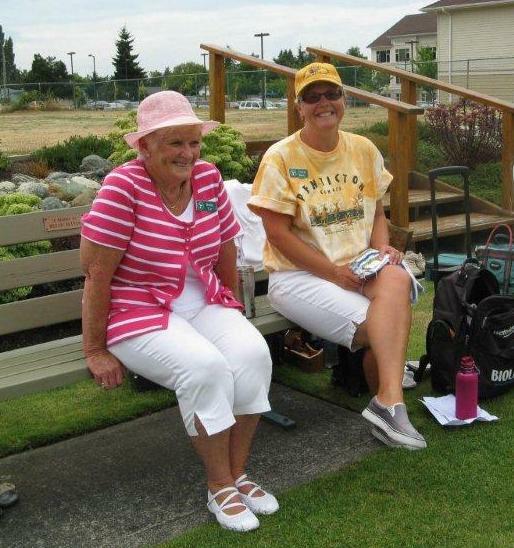 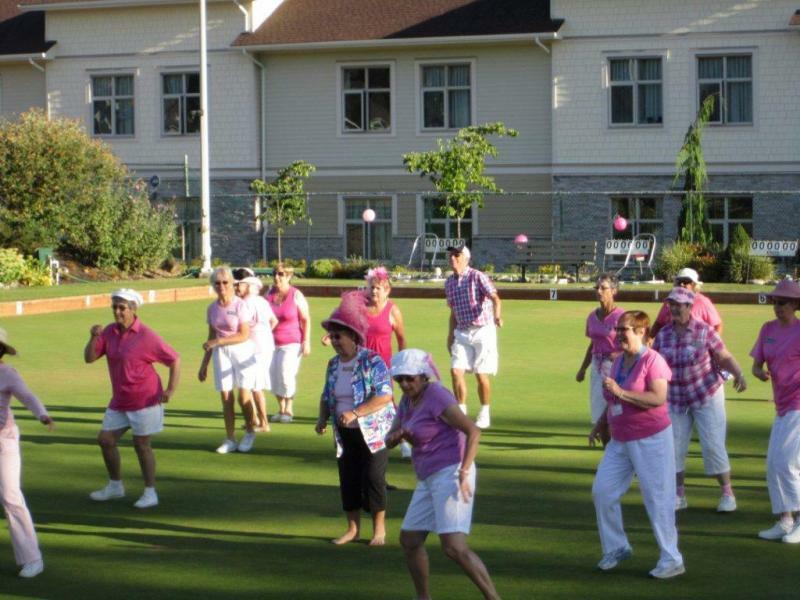 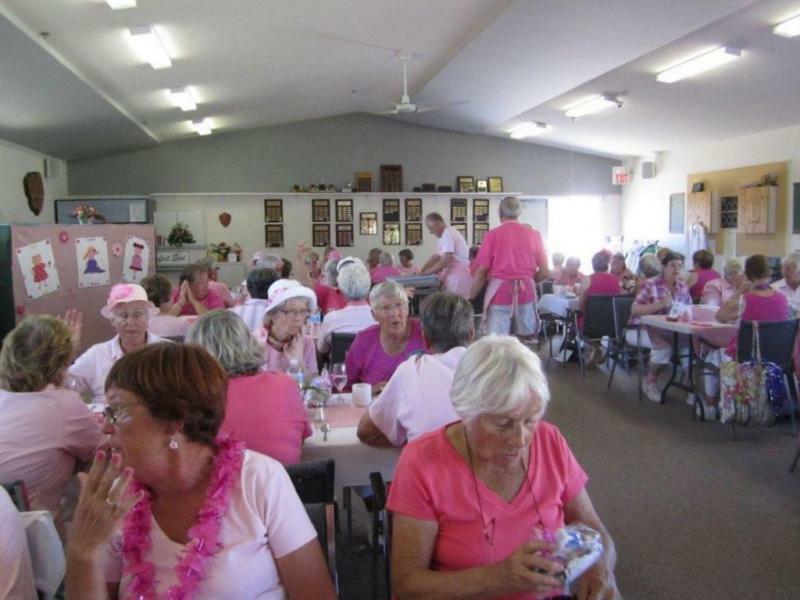 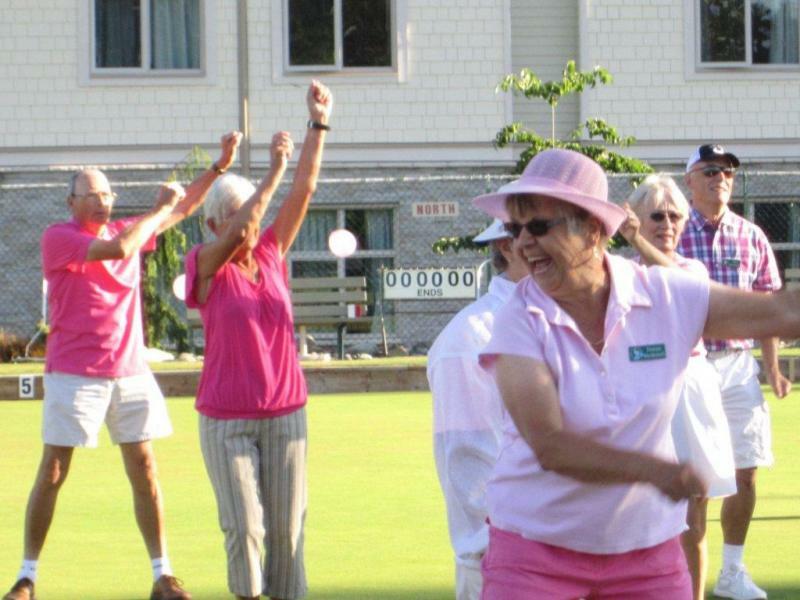 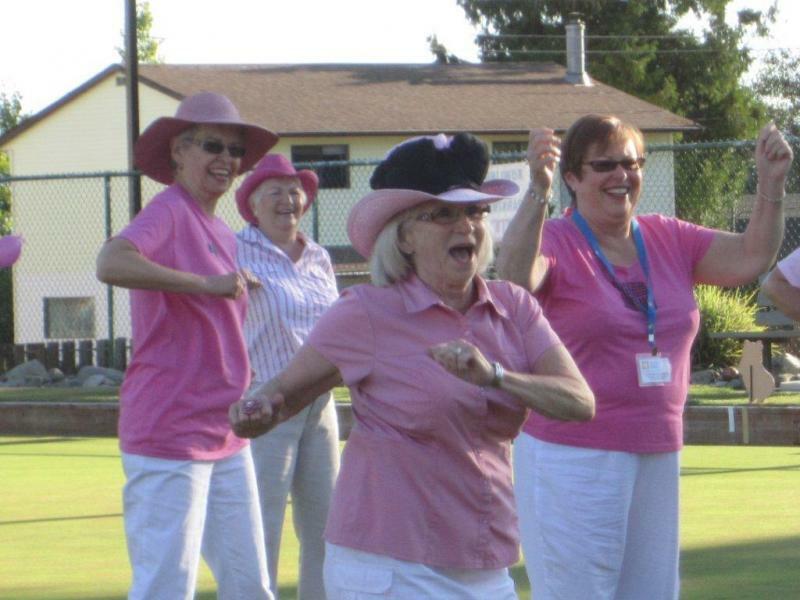 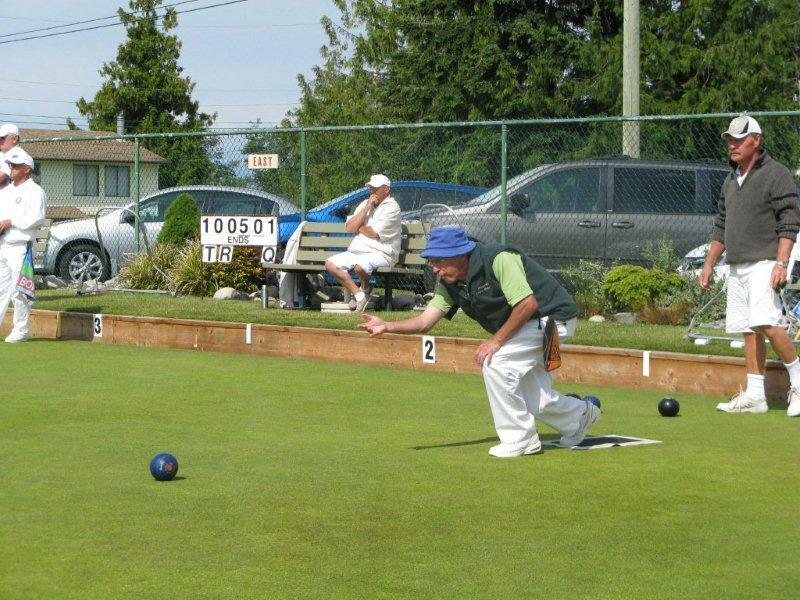 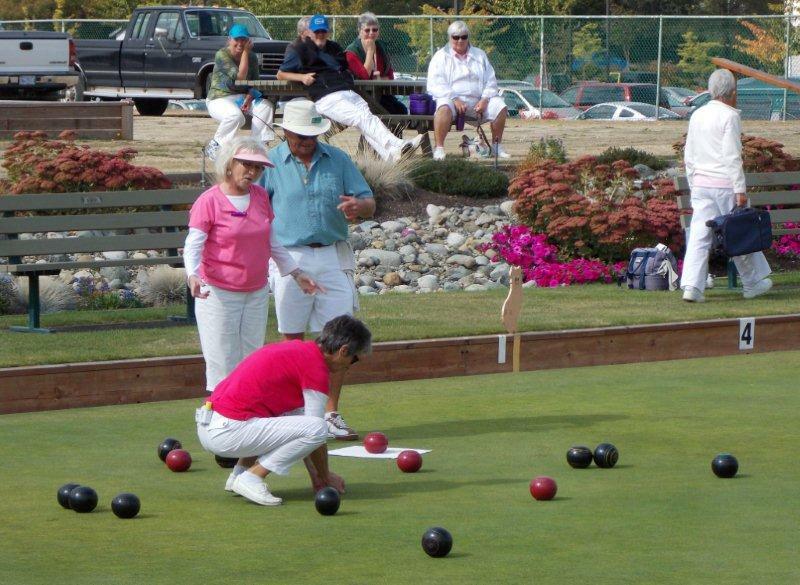 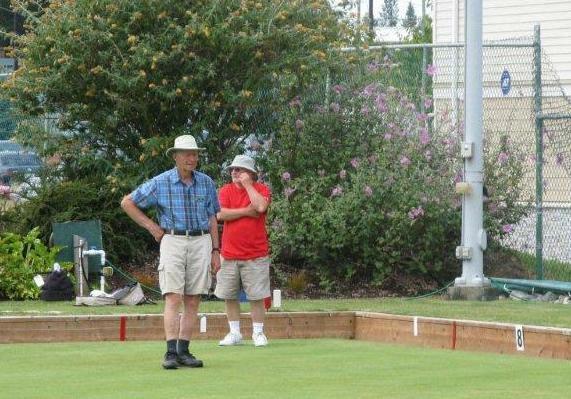 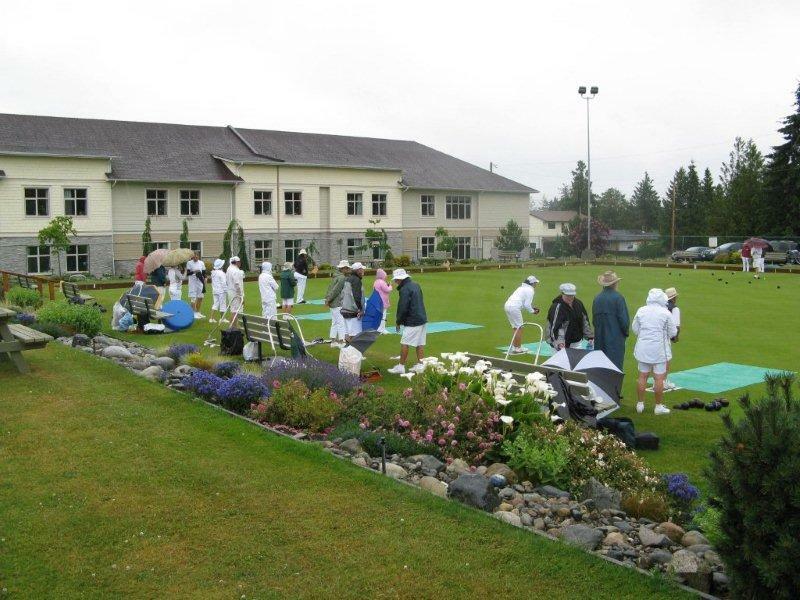 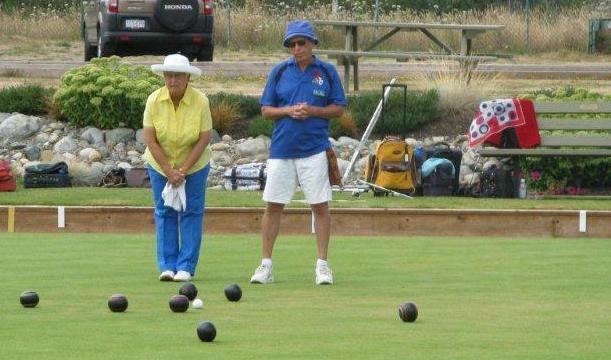 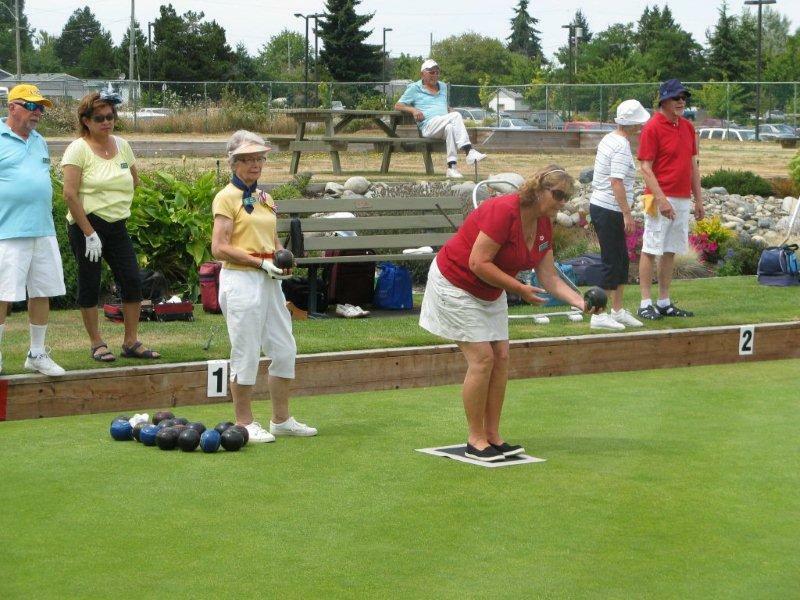 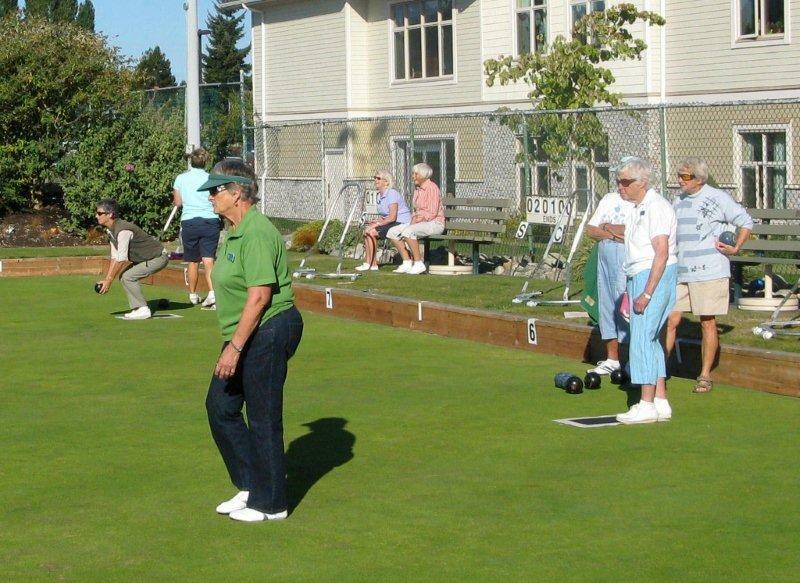 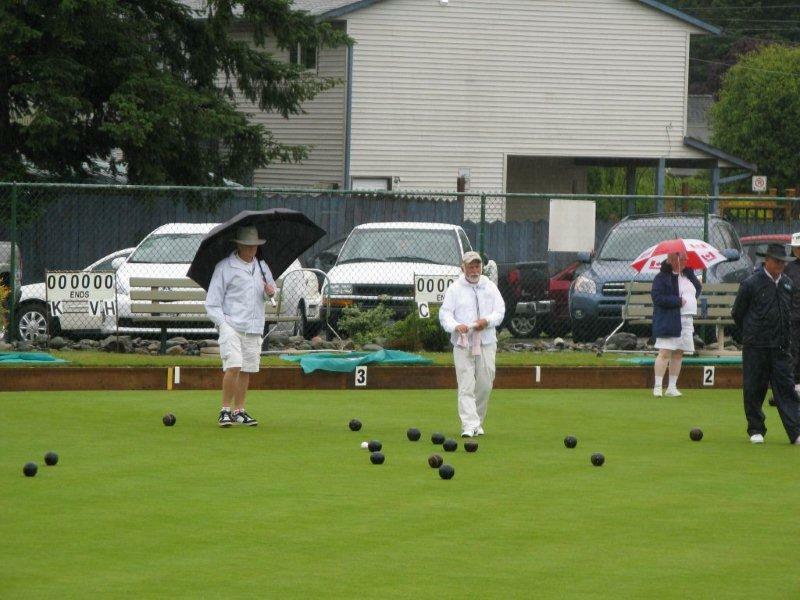 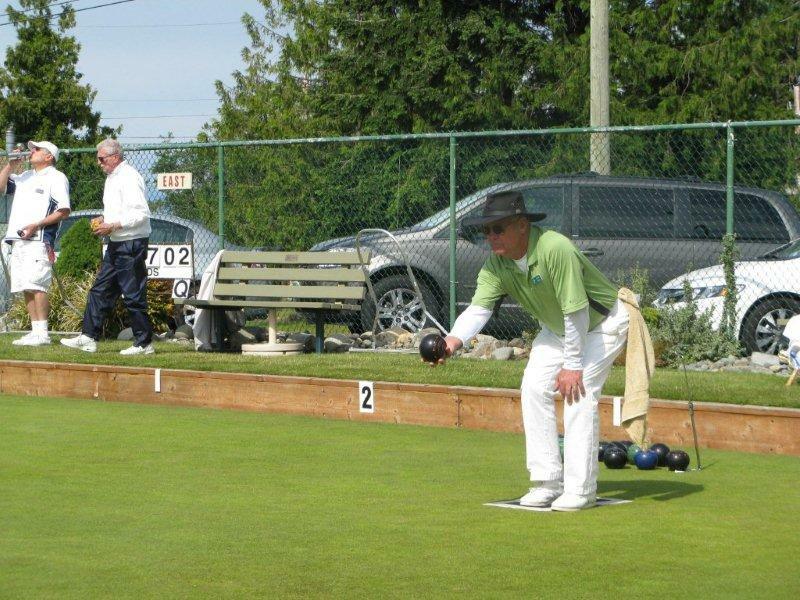 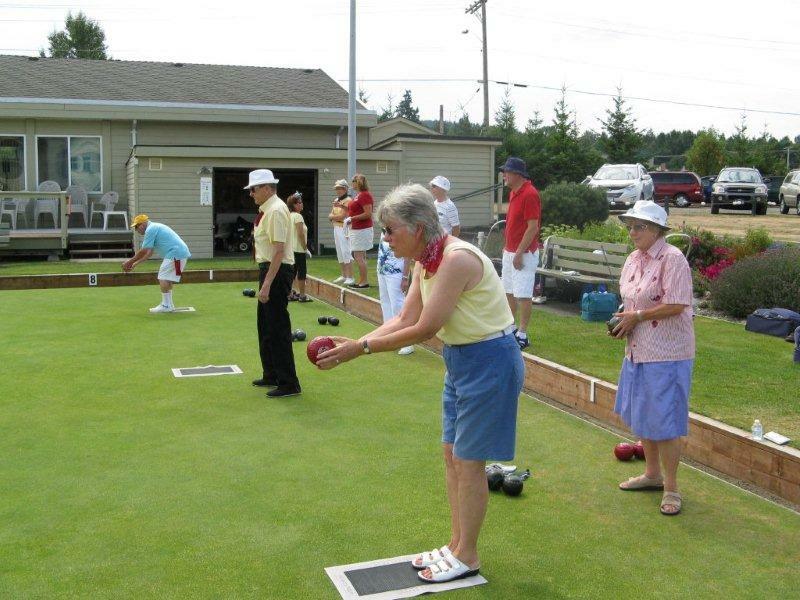 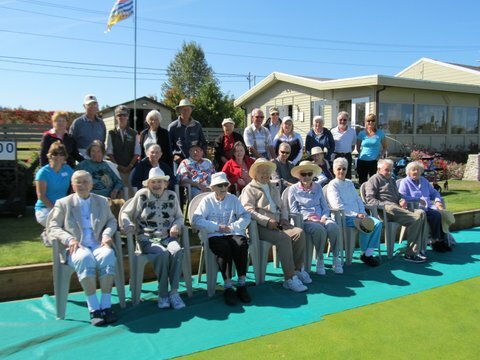 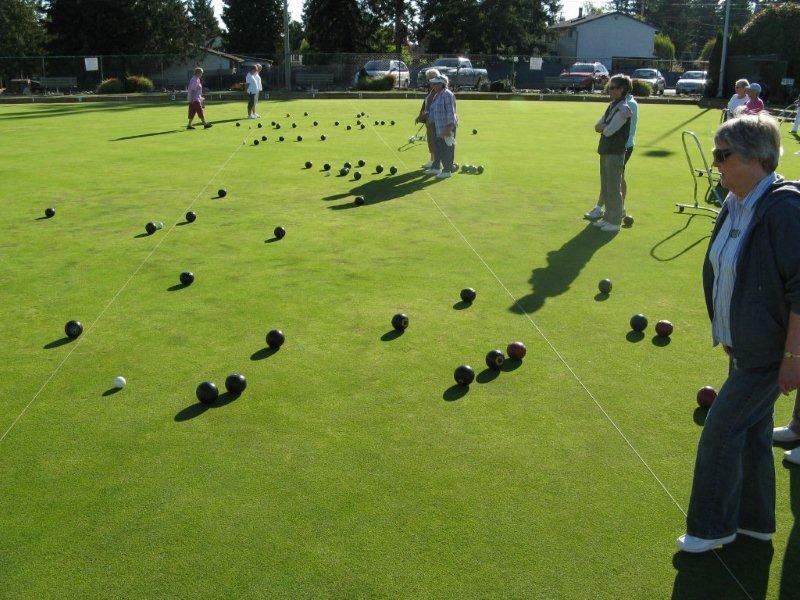 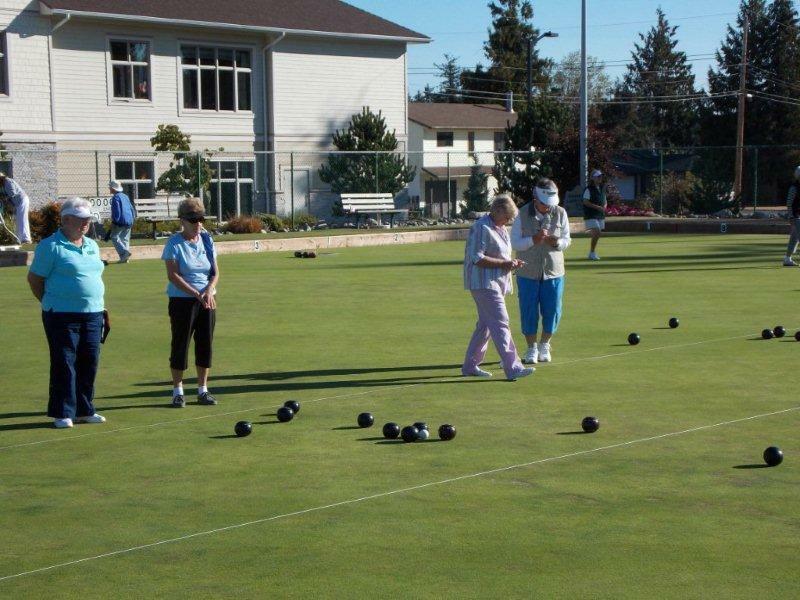 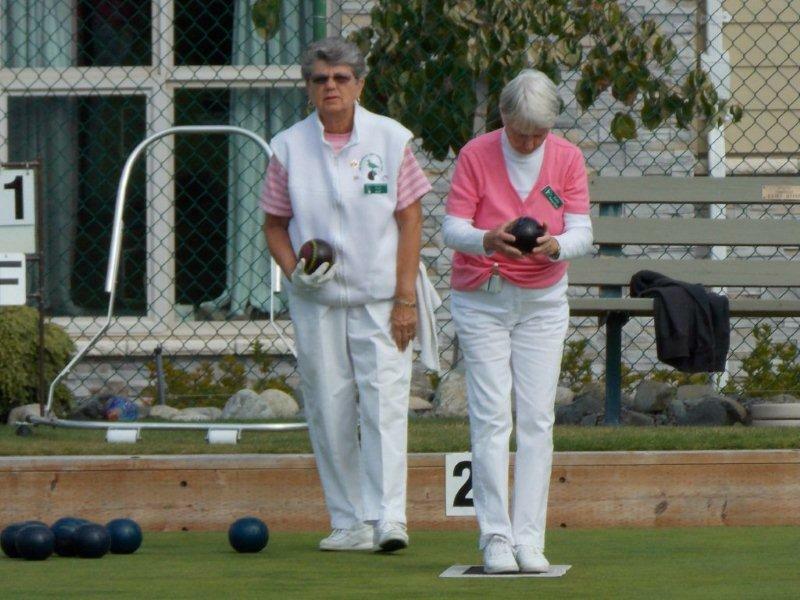 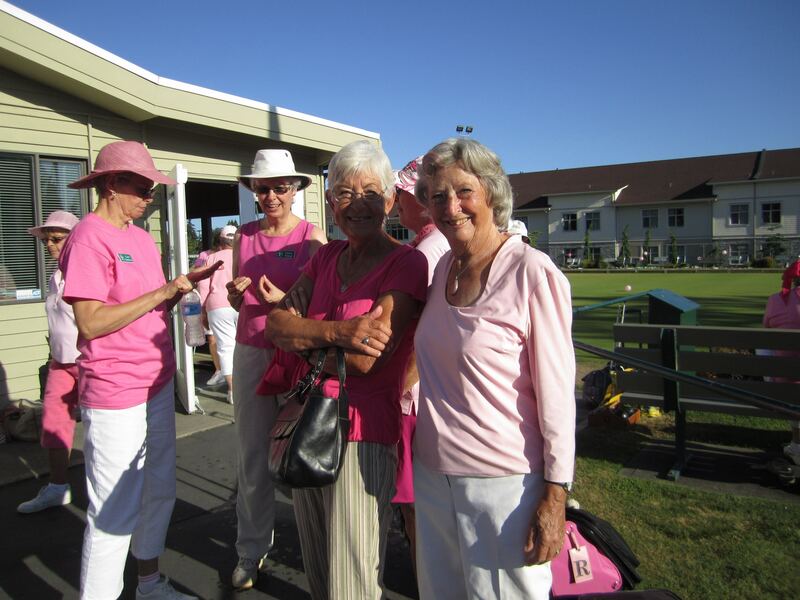 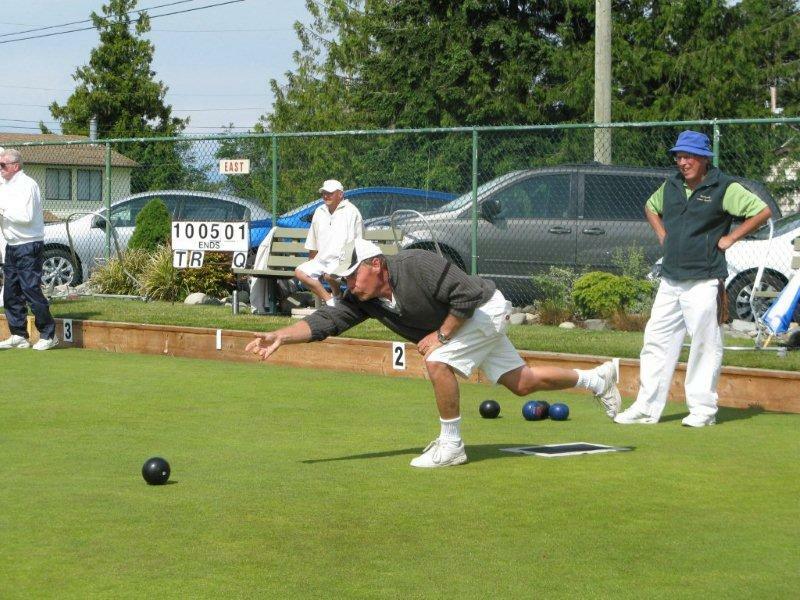 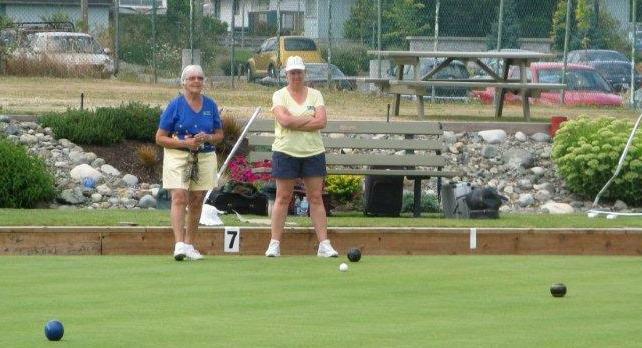 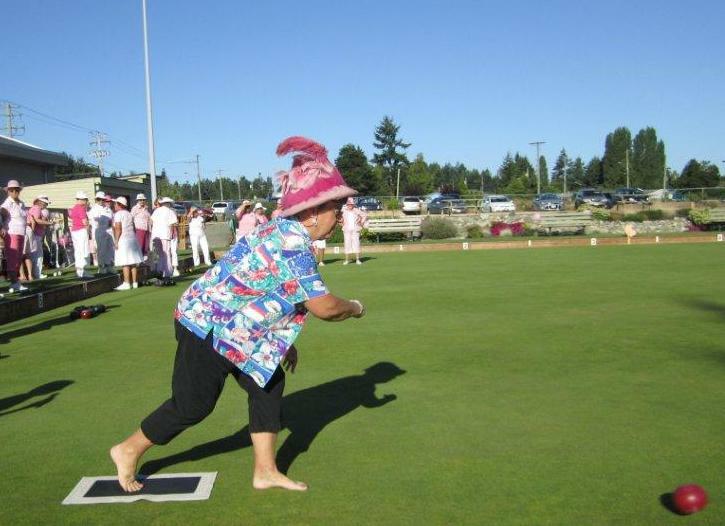 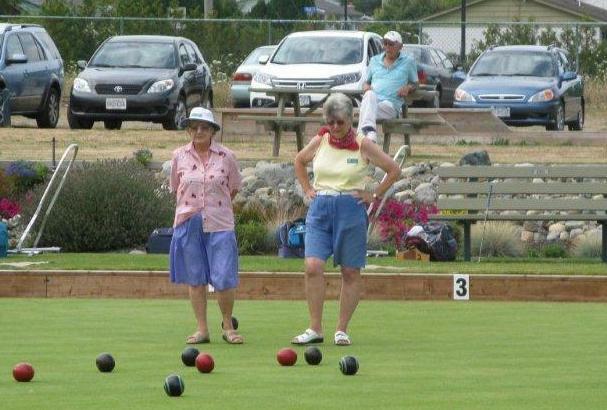 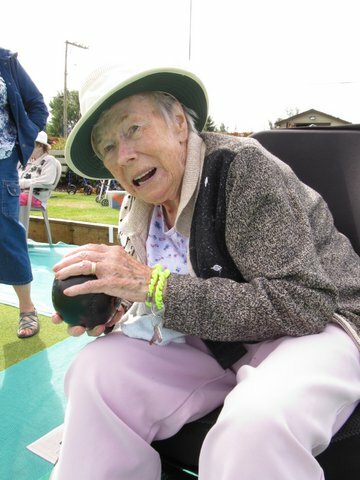 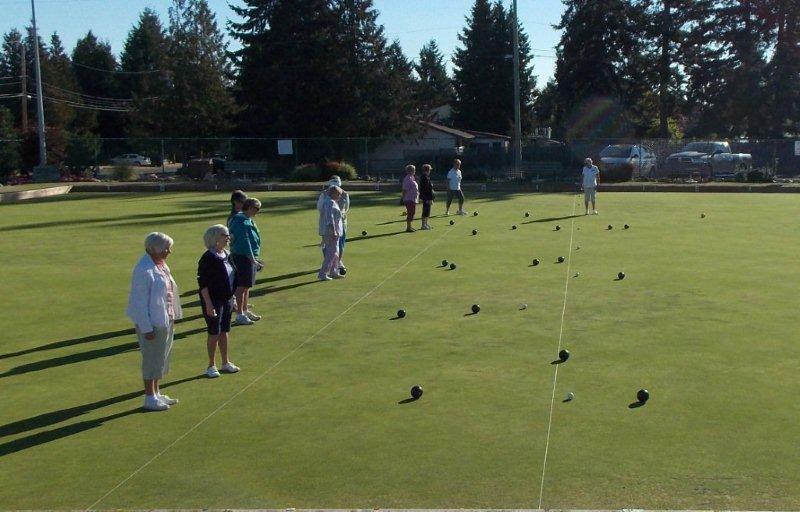 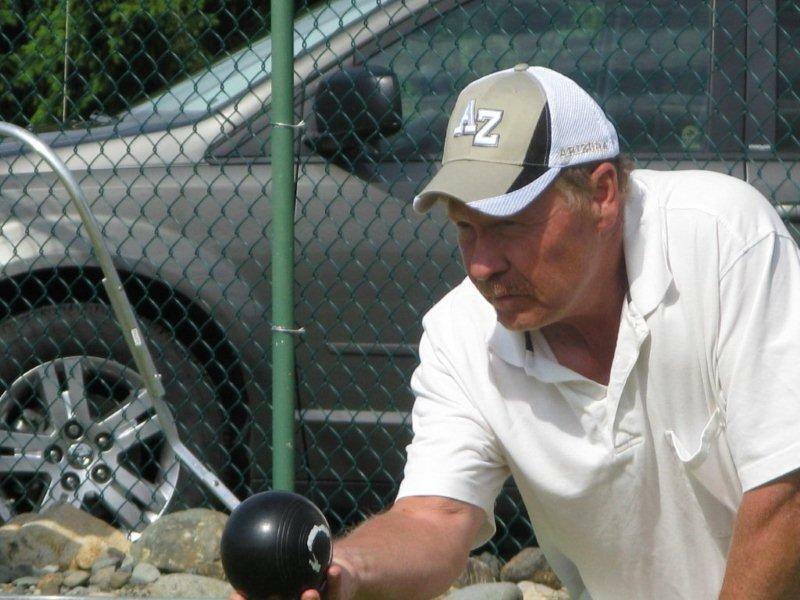 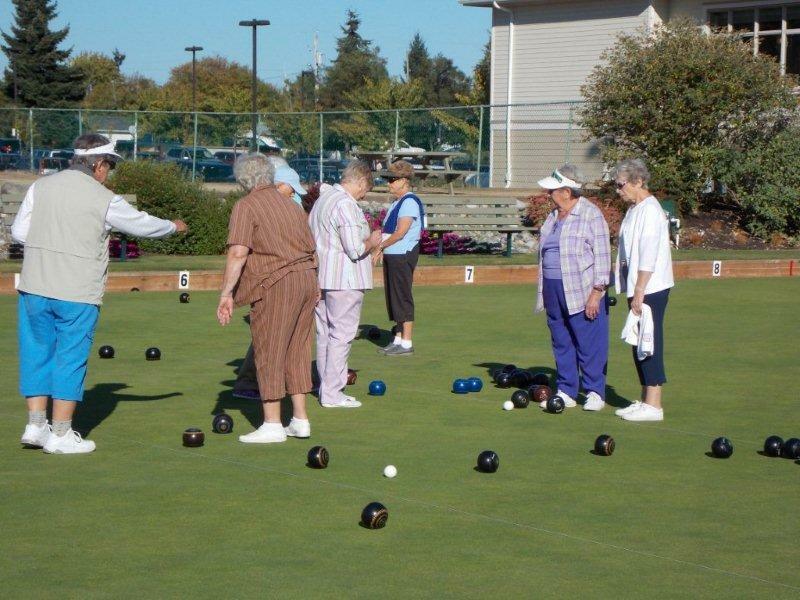 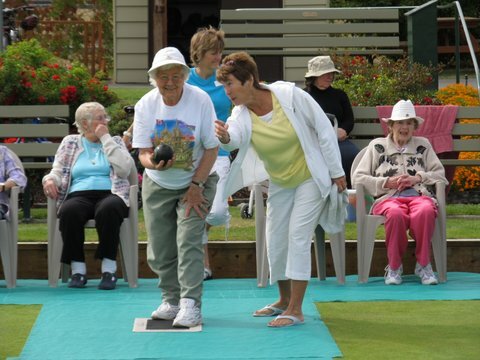 Parksville Mayor Chris Burger was in attendance to throw the first bowl of the season. 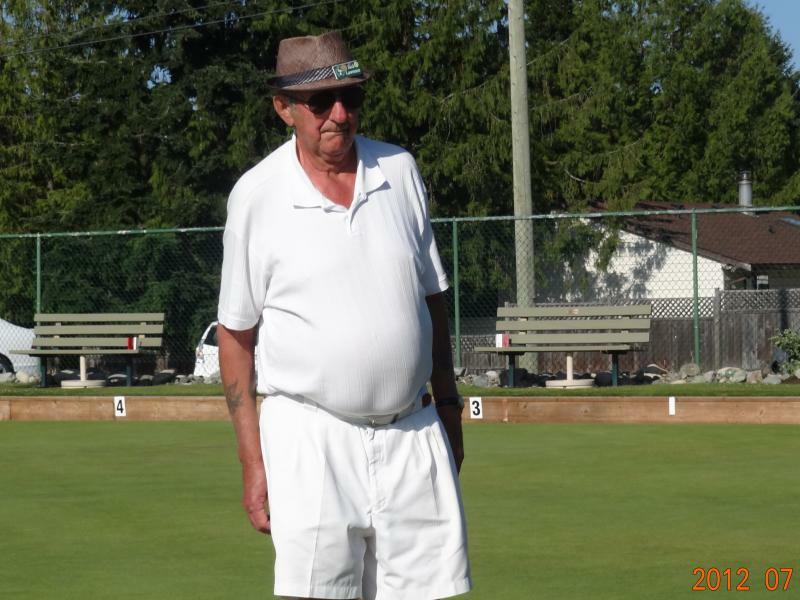 And finally, 'tis the man himself!!! 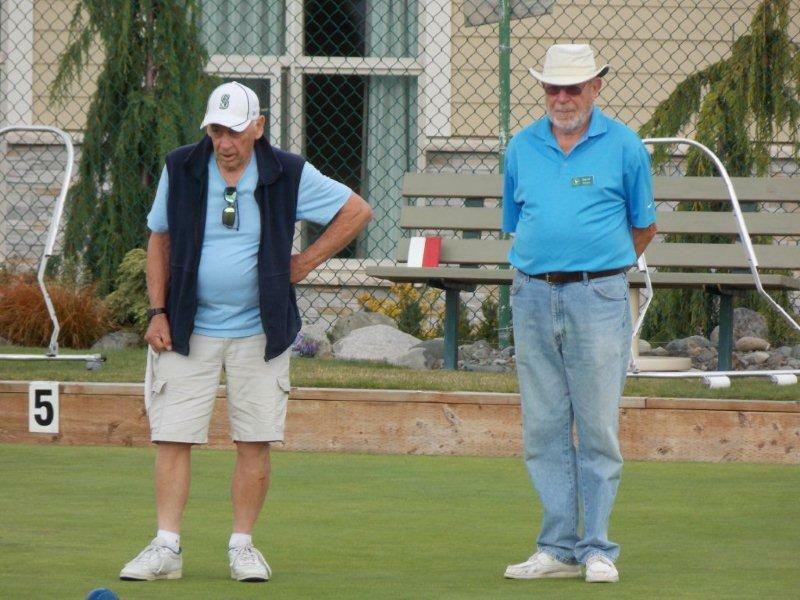 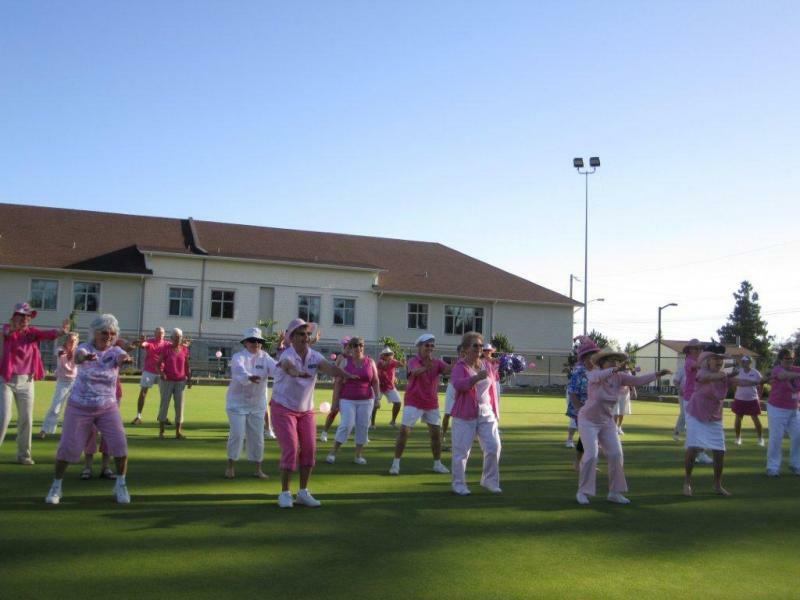 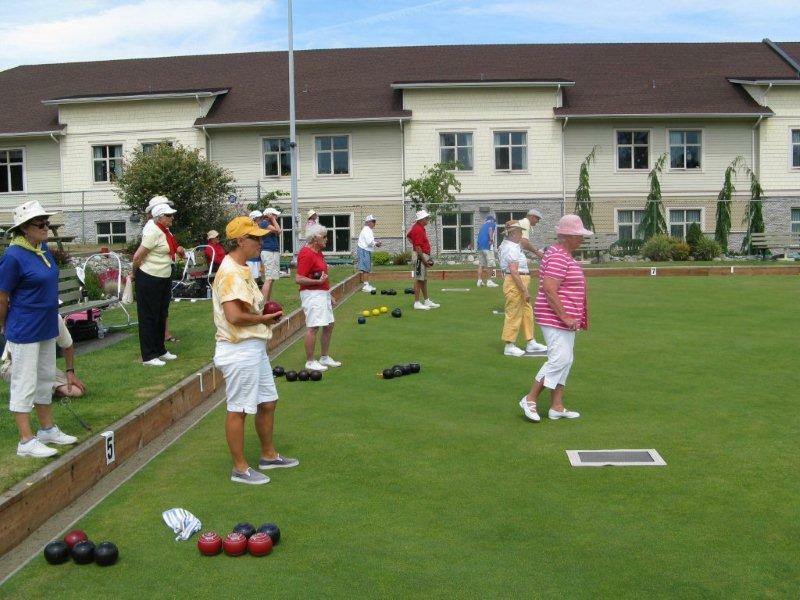 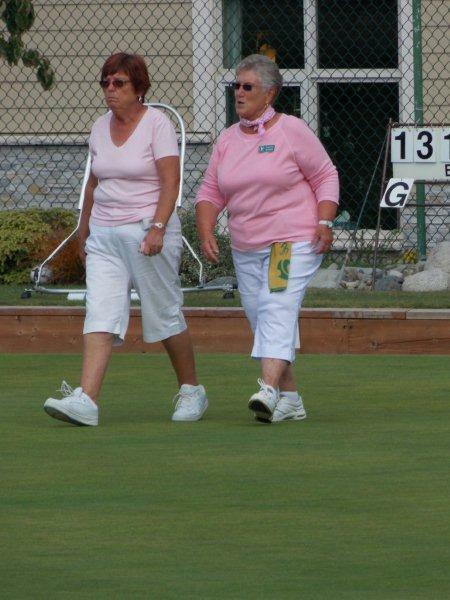 A group ofPLBC members travelled to Portugal where they were challenged by the local UK expatriate community to take on the best bowlers that the UK had to offer. 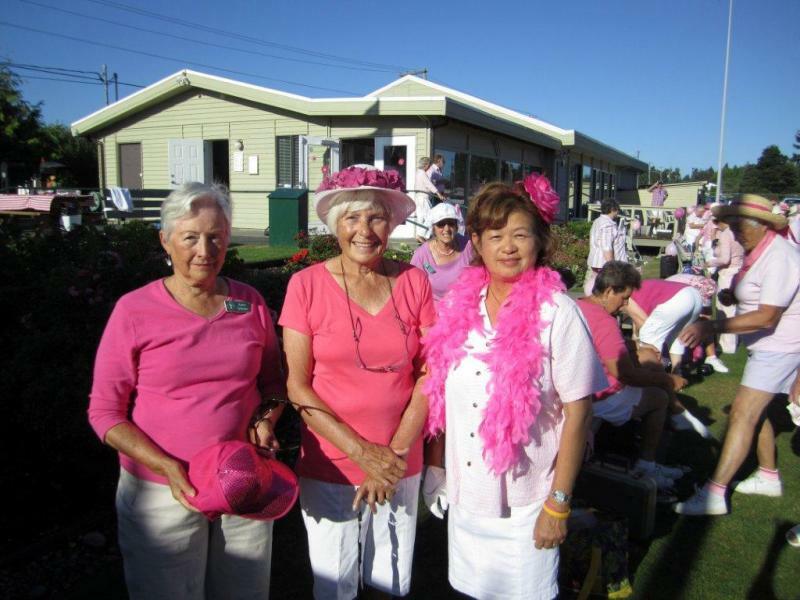 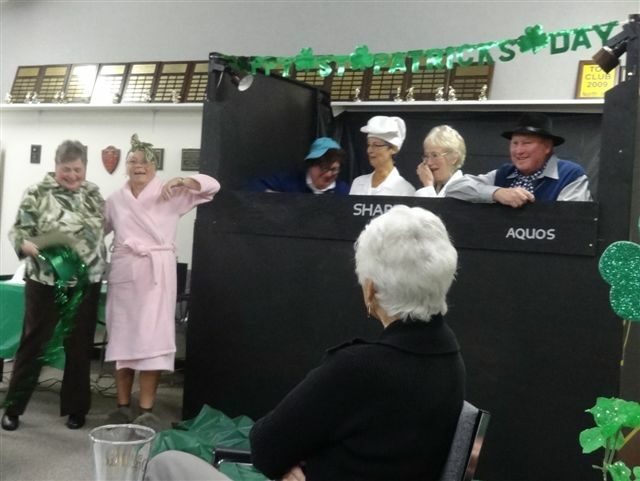 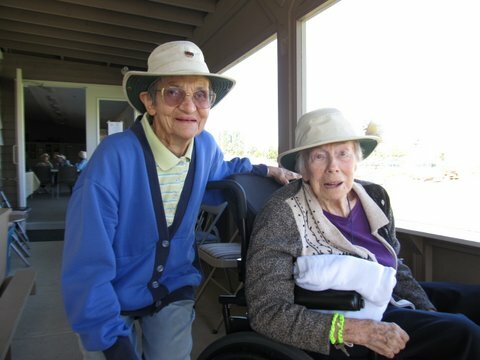 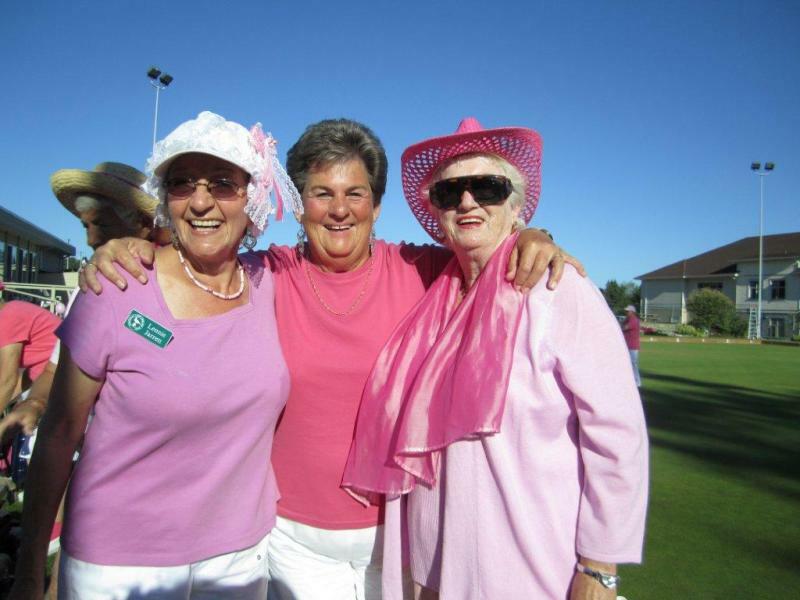 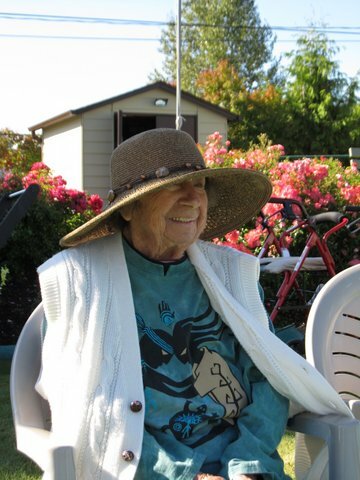 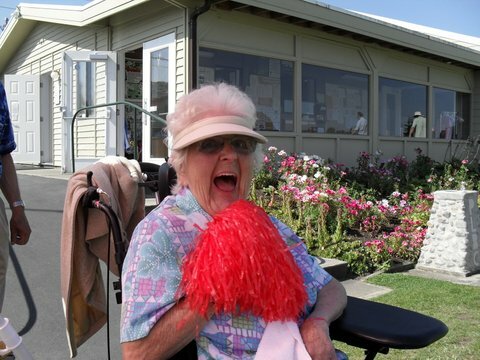 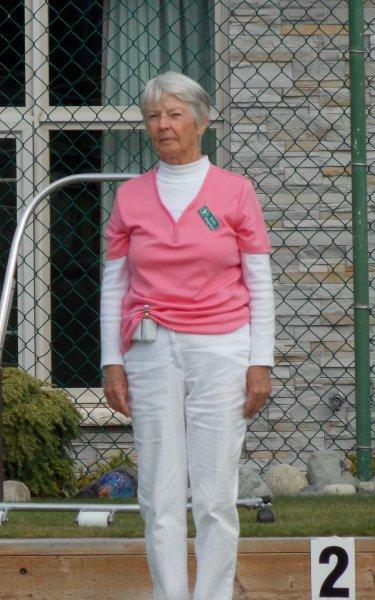 Apparently Nel was outstanding and the group as a whole left a lasting impression, both on and off the green. 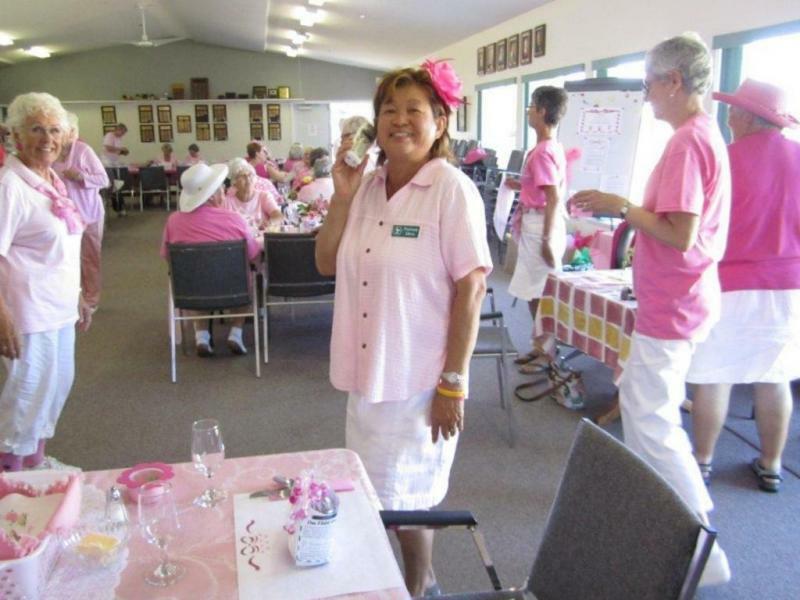 Chris Lethbridge took the following twopics in Western Australia at a place called Geraldton. 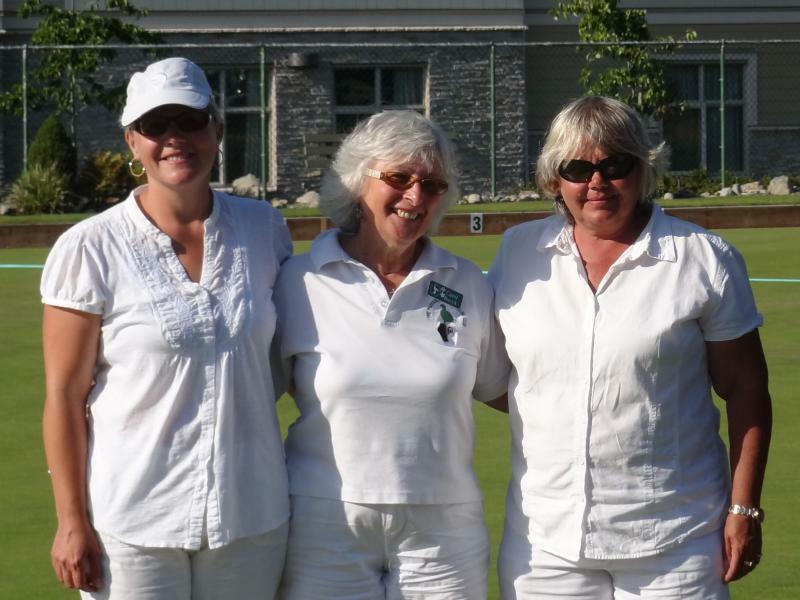 There are three greens - nobody was playing that day because it was deemed too hot at 42 degrees C - but what a fantastic facility!